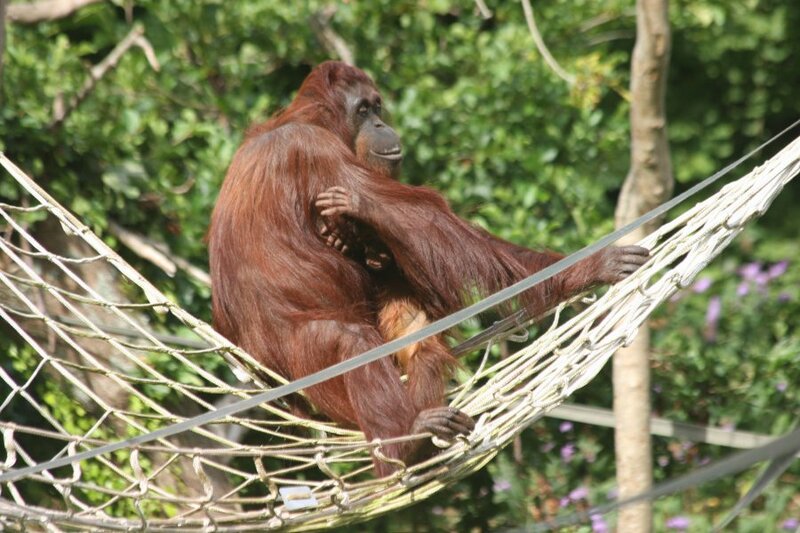 A return visit to Paignton Zoo. Our last visit here was 16 years earlier on honeymoon, before we had any idea about reptiles and exotic animal care. This visit would be a more educational one, for a special behind-the-scenes tour. And with a better camera. 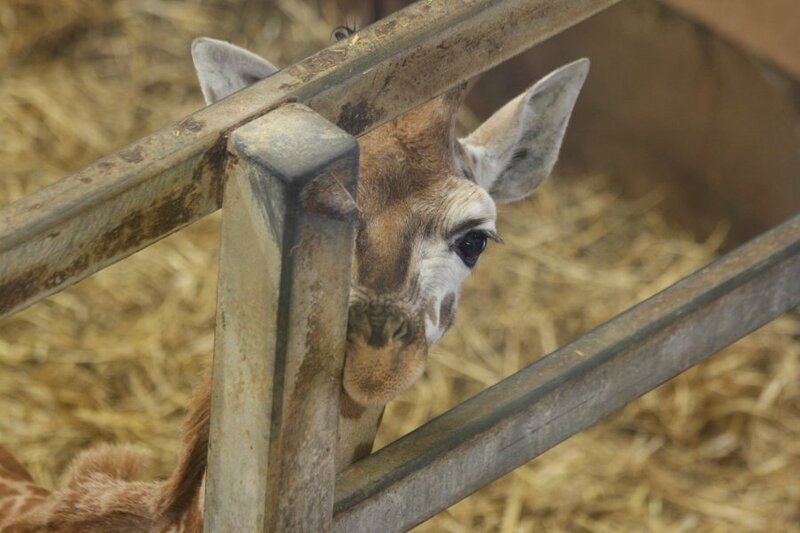 Like most major zoos, it undertakes a great deal of conservation work, and breeding programs for endangered species; the public displays are there to fund the work and provide public education. 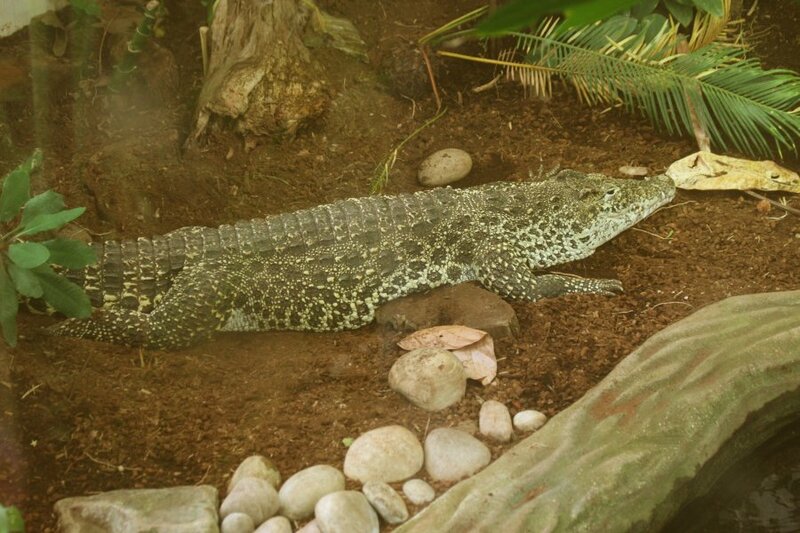 The Reptile Tropics is listed as one of their major exhibits, where they certainly do try to make enclosures that look beautiful. 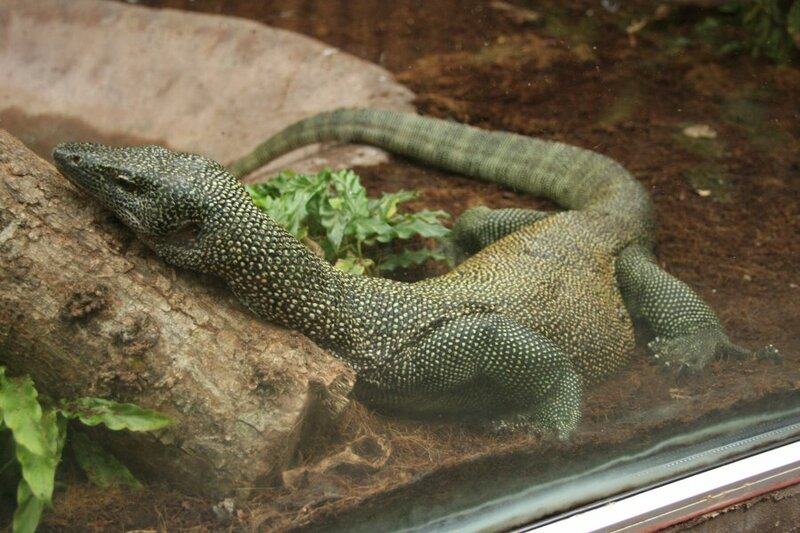 But we were very happy to hear that there were plans to overhaul the various reptile sections, since some parts of them were quite dated, lacking many of the advances in reptile lighting. The conservation and breeding work is done in less impressive but more functional enclosures, with much better lighting. 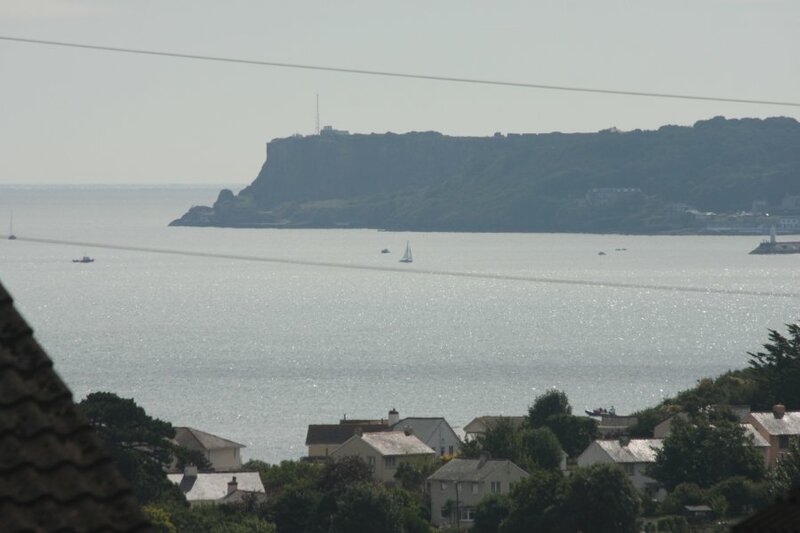 View over Tor Bay towards Berry Head, from the zoo. Red kangeroo, the largest marsupial, and the only Australian mammal we saw. 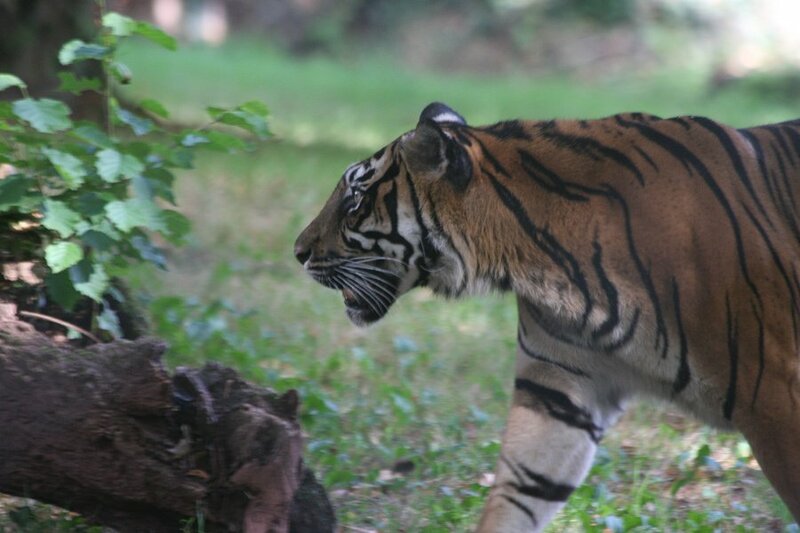 Sumatran tiger patrolling a large enclosure. Mother and baby Bornean Orangutan. Mother climbs down carefully, baby takes the direct route. 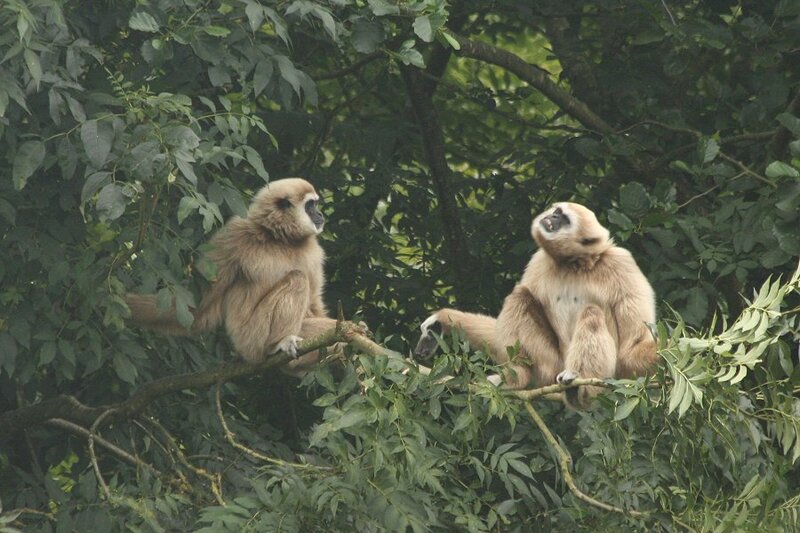 Lar gibbons, also from southeast Asia. Pygmy slow loris, a small primate from southeast Asia, hiding behind its light. These are unique for primates, in that they have a toxic venom. They transfer it from their arm glands into their mouth, to push into a wound when biting. House cats produce the same type of toxin in their fur (which causes allergic reactions), and is similarly transferred into their mouths when licking fur. 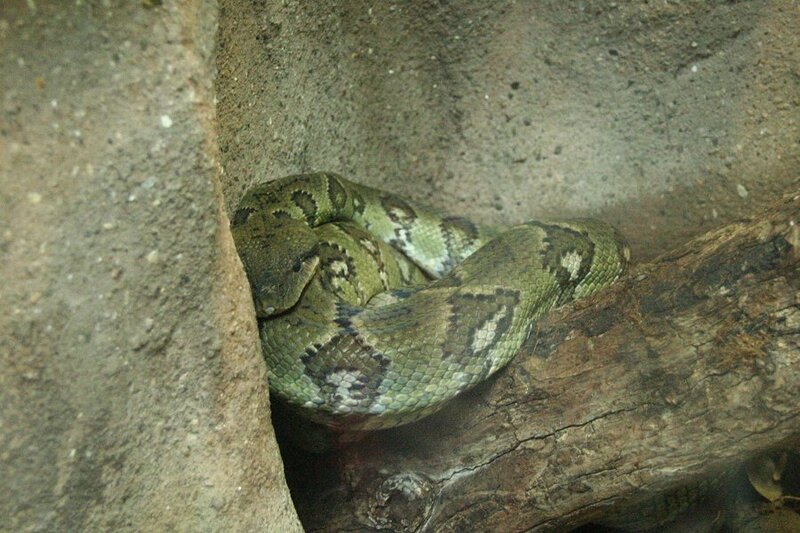 Cats (for various technical reasons relating to venom needing to be secreted and having a dedicated injection mechanism) are not considered to be venomous, even though cat bites often lead to hospitalisation as a result. 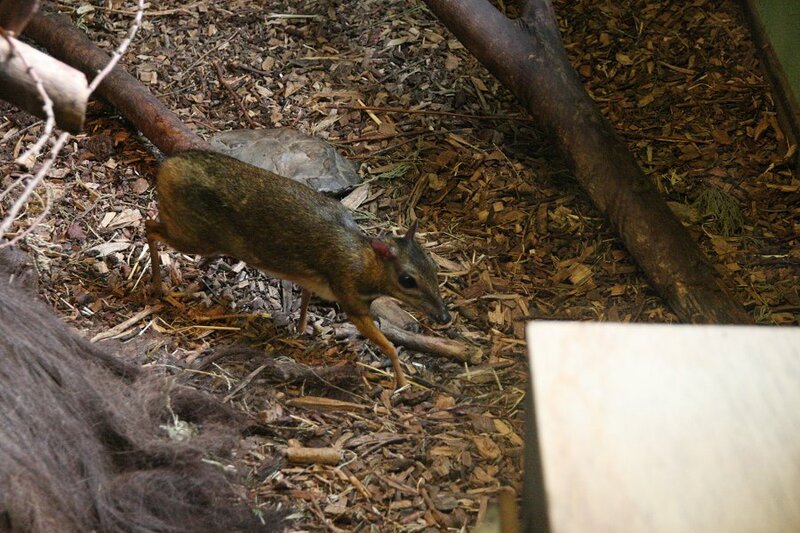 Lesser mouse deer, the smallest deer, from southeast Asia. It is about 45 cm long. 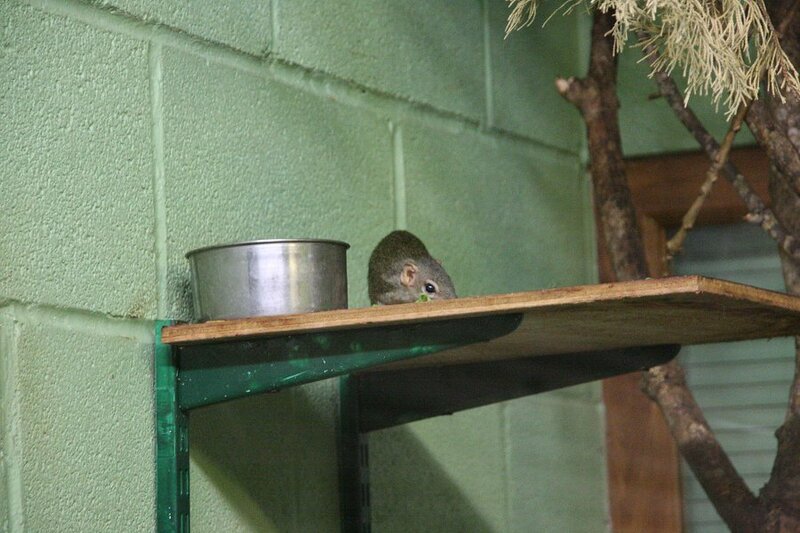 Northern treeshrew from southeast Asia. 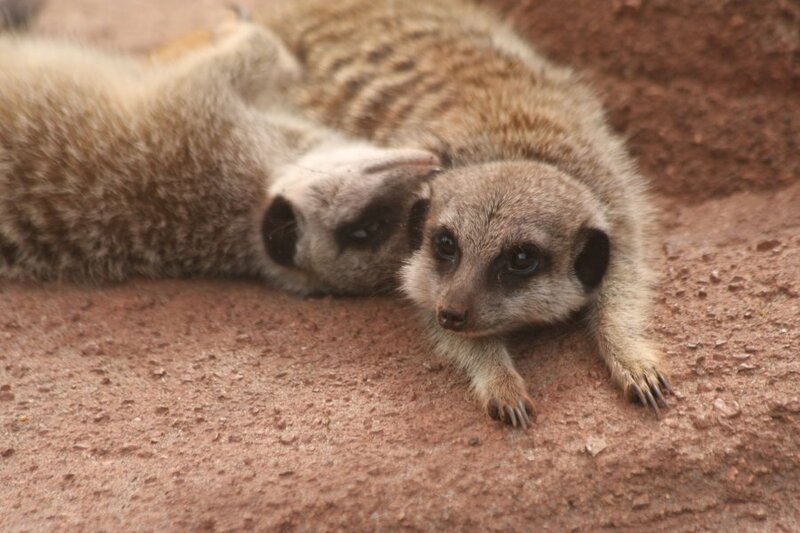 These may look like rodents, but are more closely related to primates. 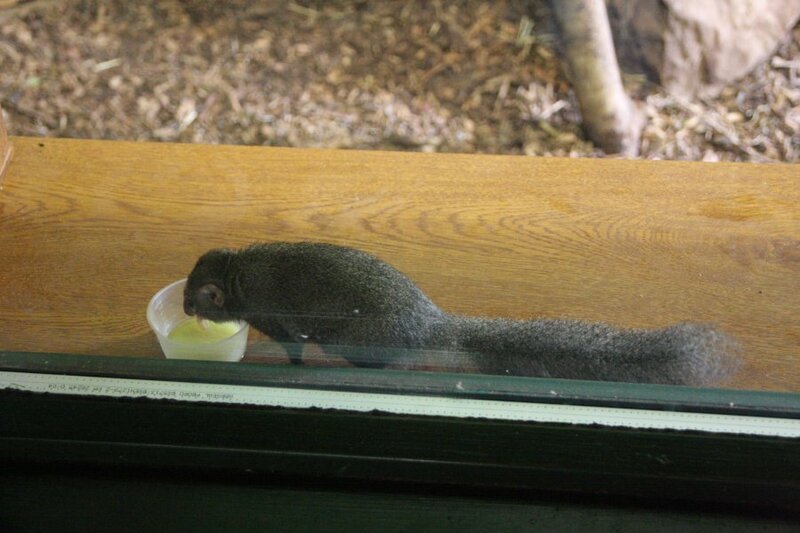 Northern treeshrew feeding; their natural diet is fruit. 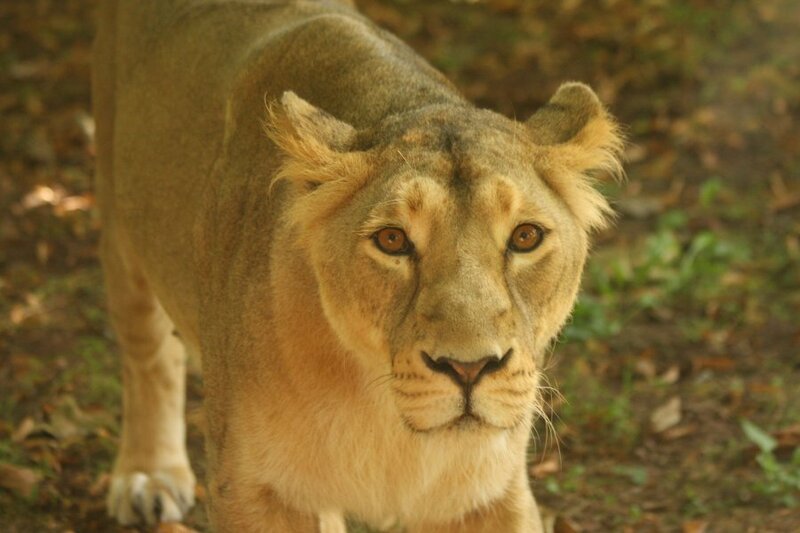 Female Asiatic lion. These endangered lions once were found over much of southern Asia and even Europe, but are now found only in a tiny range within India. 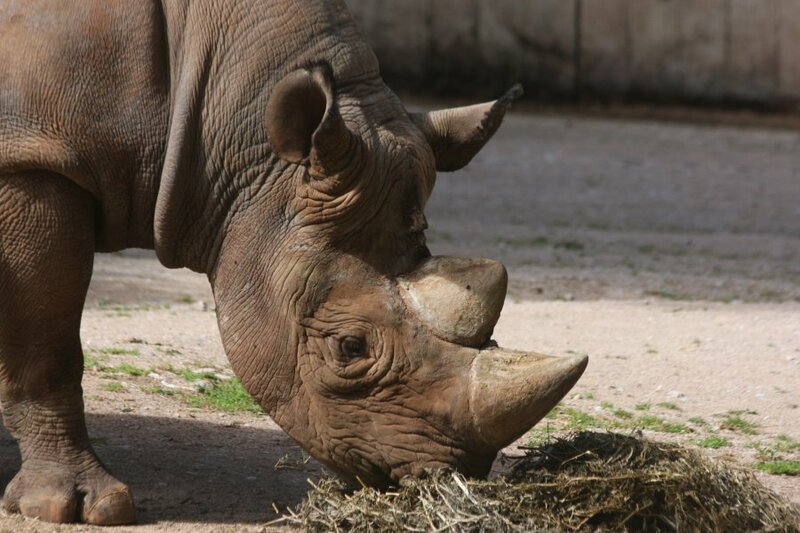 Humans have hunted them almost to extinction. 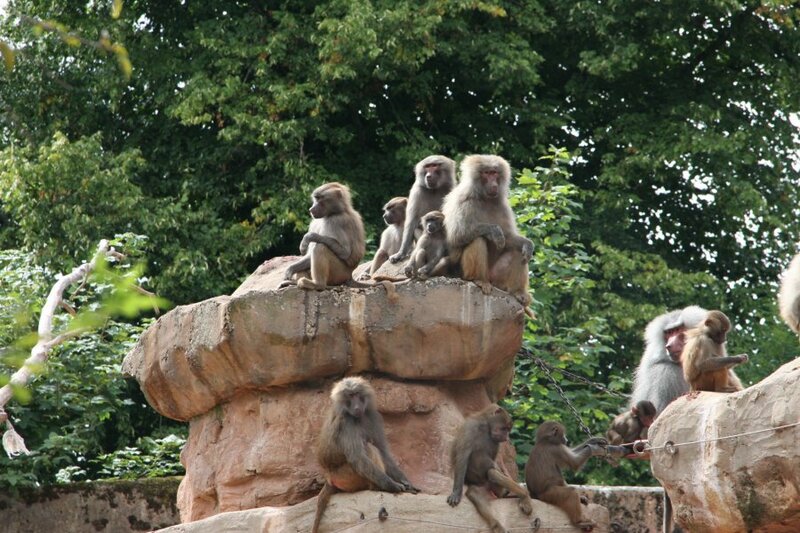 Hamadryas baboon troop, with obvious large males and smaller females. These are from Africa and Arabia. 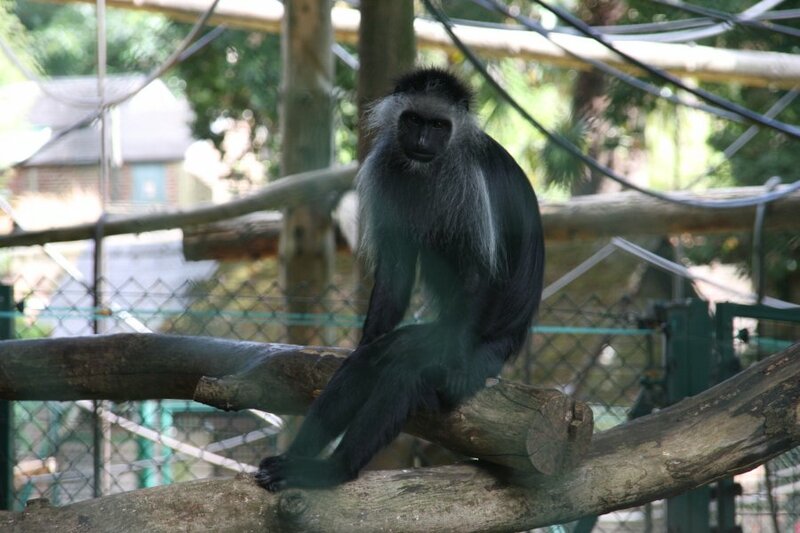 King colobus, an African monkey. Lone cheetah, sitting away from the rest of the group. 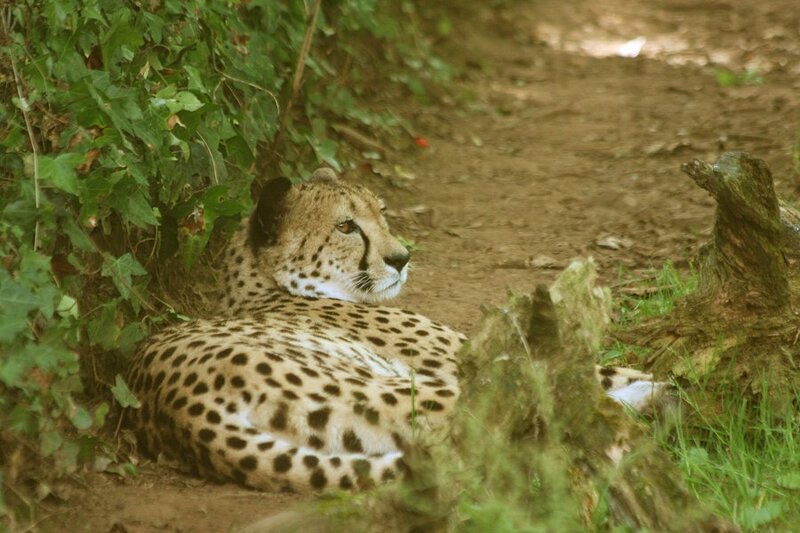 Considering that you never see them doing anything except resting, it's hard to imagine that these are the fastest land animal, running as fast as a car on a motorway. 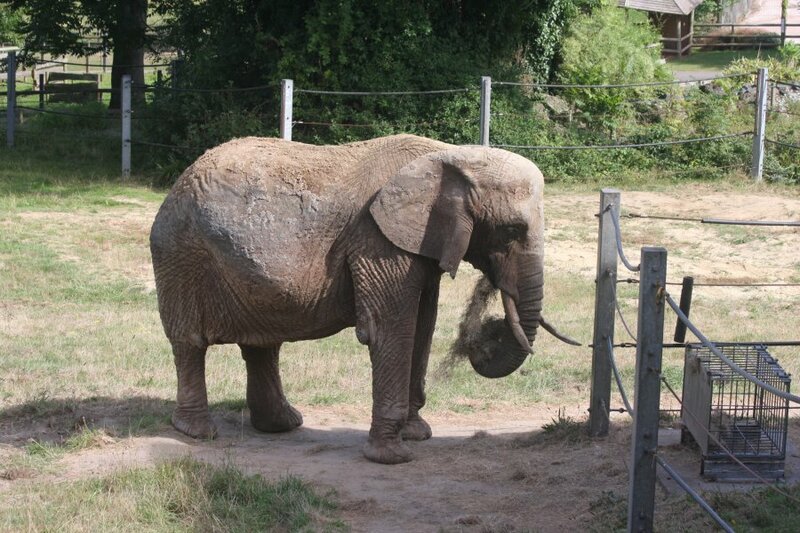 Duchess, the 46 year old African Elephant. This is probably the same one that we saw 16 years ago. After outliving her old companion, she has lost the eye on her right side due to age related illness, but her other eye still works. 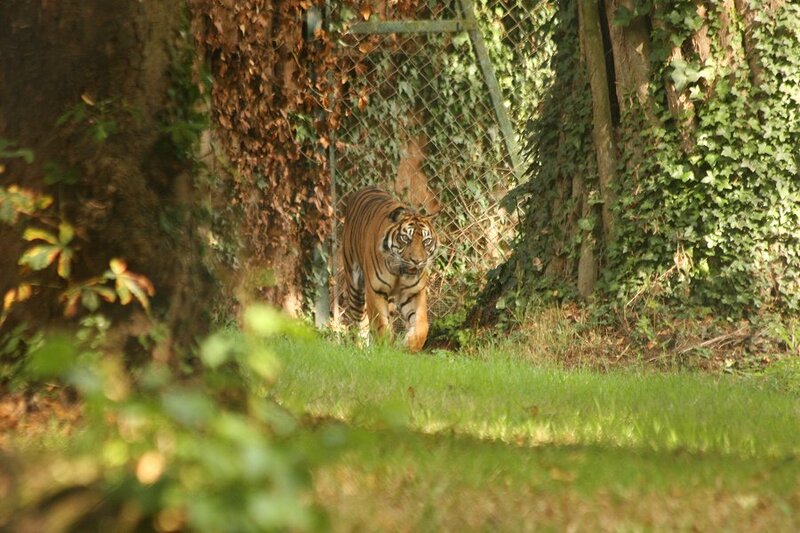 The zoo made the decision to keep her here in familiar surroundings, rather than stressing an old lady with new surroundings or new companions, so that she can live out her final years in a place where she is happy. 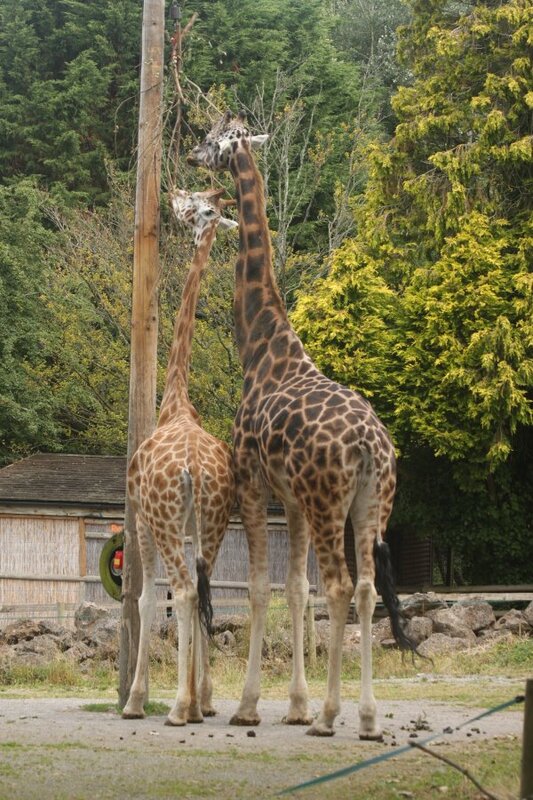 Rothschild's giraffes, the endangered variety of giraffe. Neither of these are the one we photographed previously, but presumably it is still here somewhere. 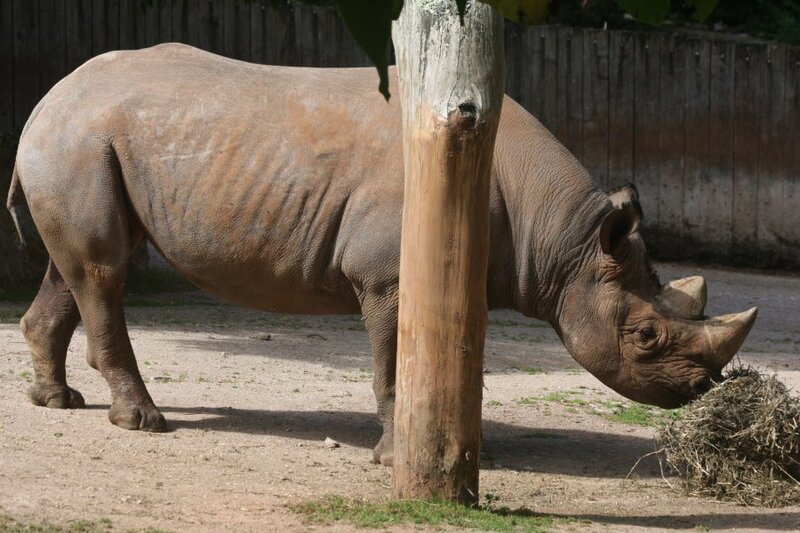 Black rhino, a critically endangered African rhino. Common cusimanse, an African mongoose. These incredible little animals are quite capable of killing and eating any venomous African snake, and are immune to their venom (specifically neurotoxic venoms). 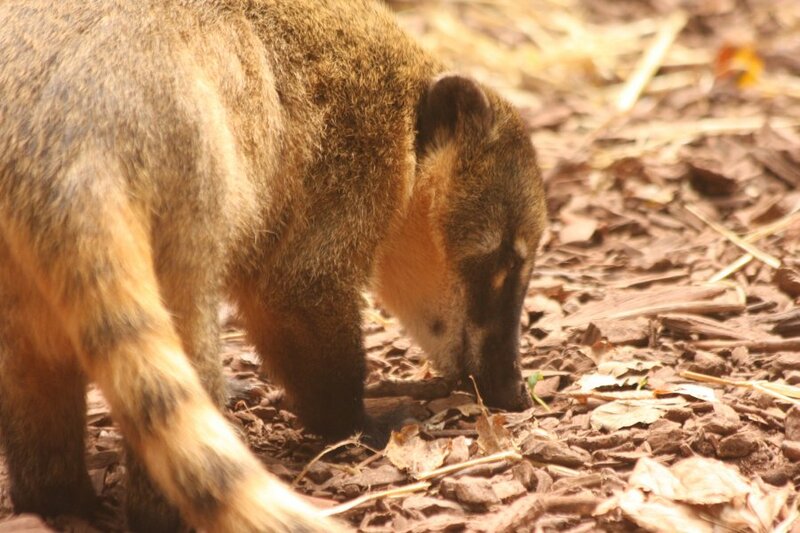 Coati, the South American version of a raccoon. 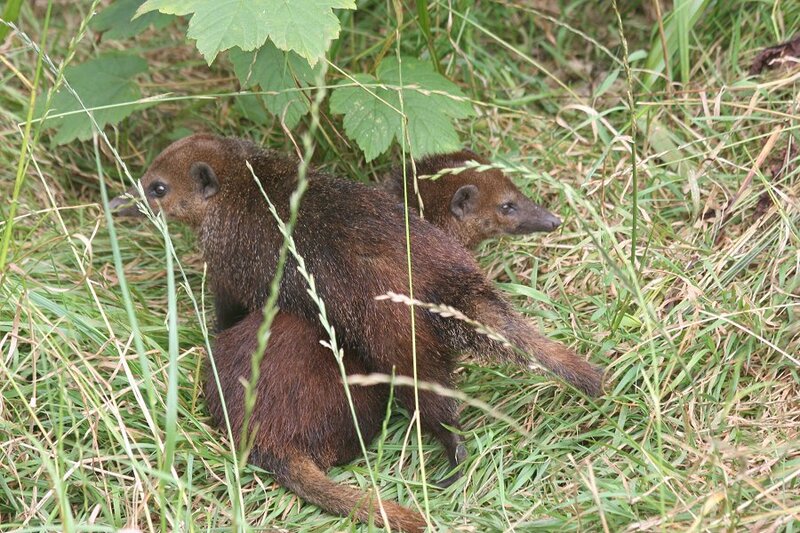 This appears to be a female, as it is small and lives in a group (the males are larger and are called coatimundi). 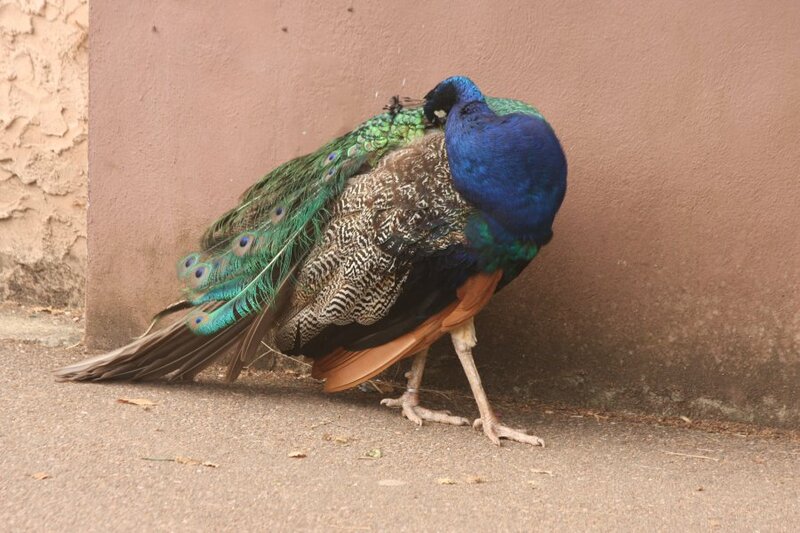 Peacock, the popular ornamental bird that originates in India. 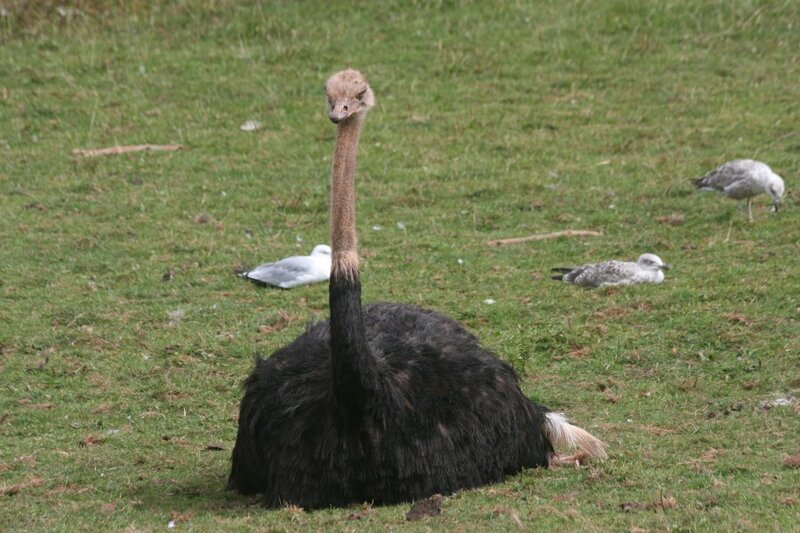 Male ostrich. Given their 45 year lifespan, this is likely to be the same one we saw previously. A large egg. 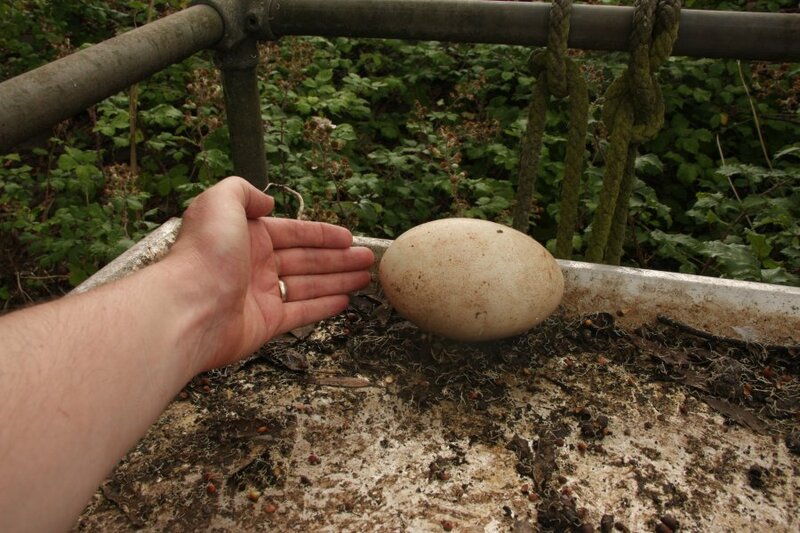 This doesn't seem to be big enough to be an ostrich egg. Perhaps it belonged to another ratite. 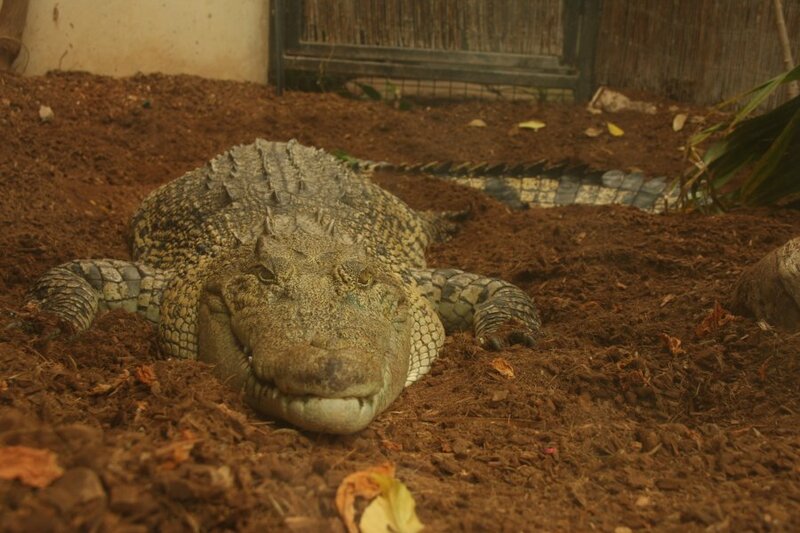 Saltwater crocodile, the largest crocodilian, which can live in either fresh or salt water. 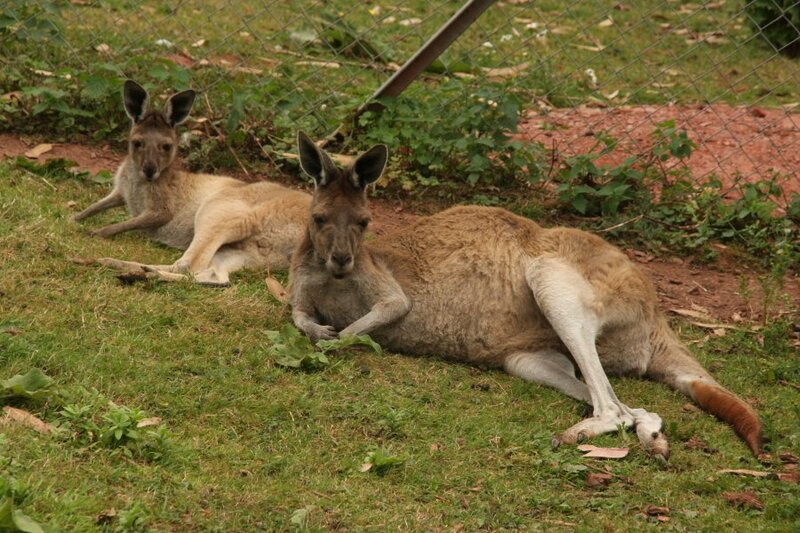 It can be found in Australia and southeast Asia, where it percieves anything that moves as food, including humans. 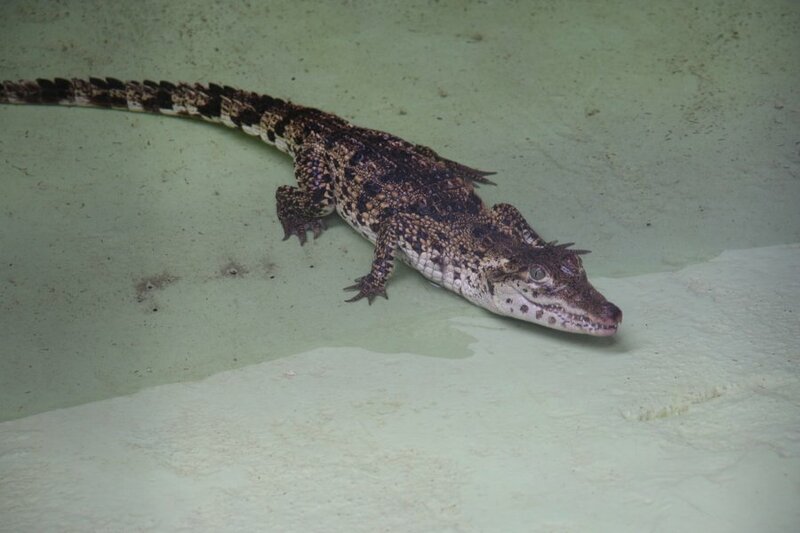 Cuban crocodile, a relatively small crocodile (2-3.5 metres long) that once spanned all of the Caribbean. It is a danger to humans, and has been hunted almost to extinction. 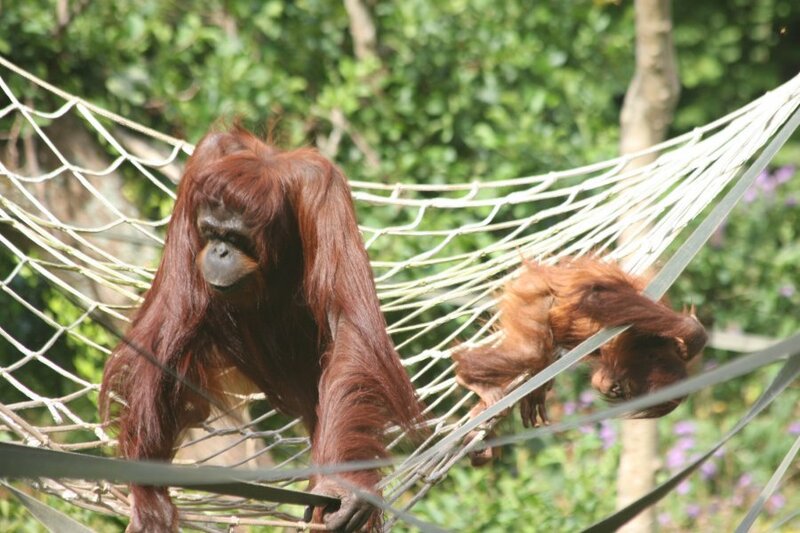 The zoo is taking part in a breeding programme to help restore their numbers. 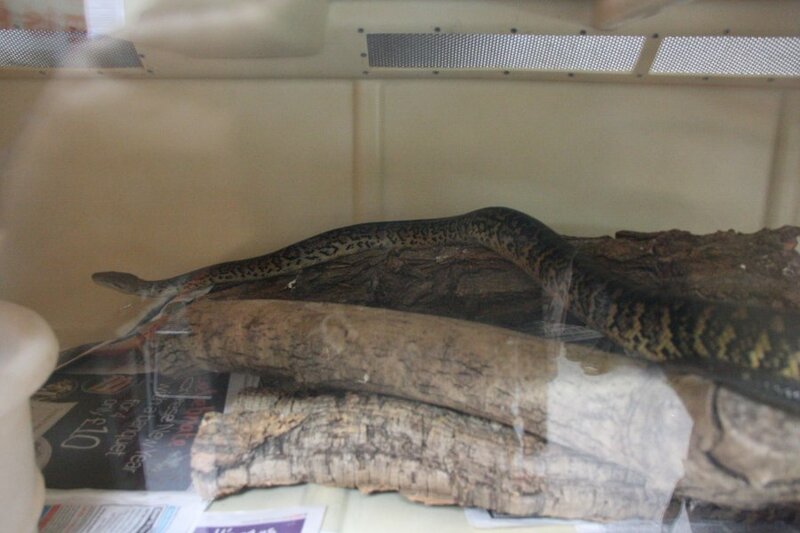 This is a 75 cm long hatchling. 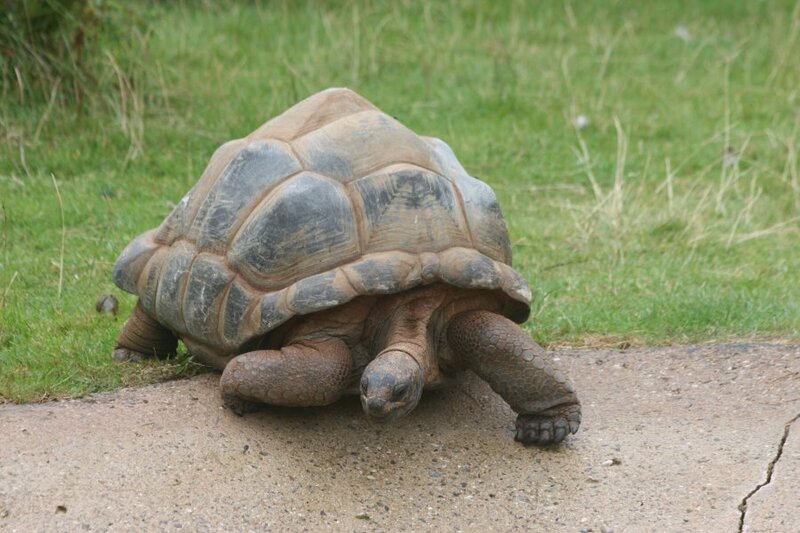 Aldabra tortoise, from an island off the coast of eastern Africa. 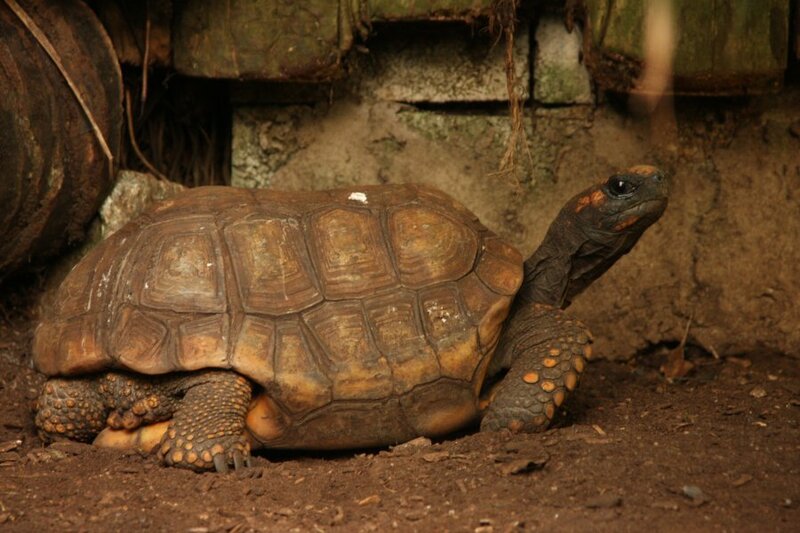 These are the longest lived of all tortoises, and the second largest. 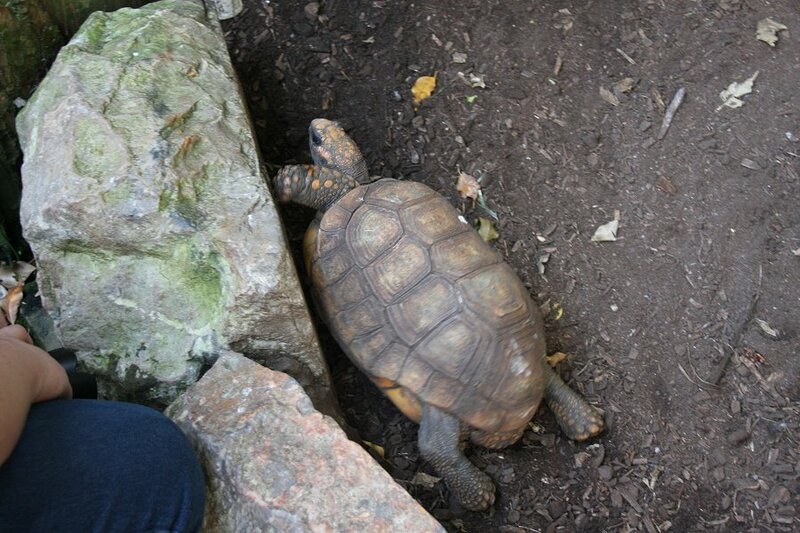 Their size and appearence is very similar to the Galápagos tortoise, though the largest Galápagos tortoises are larger than the largest Aldabras. 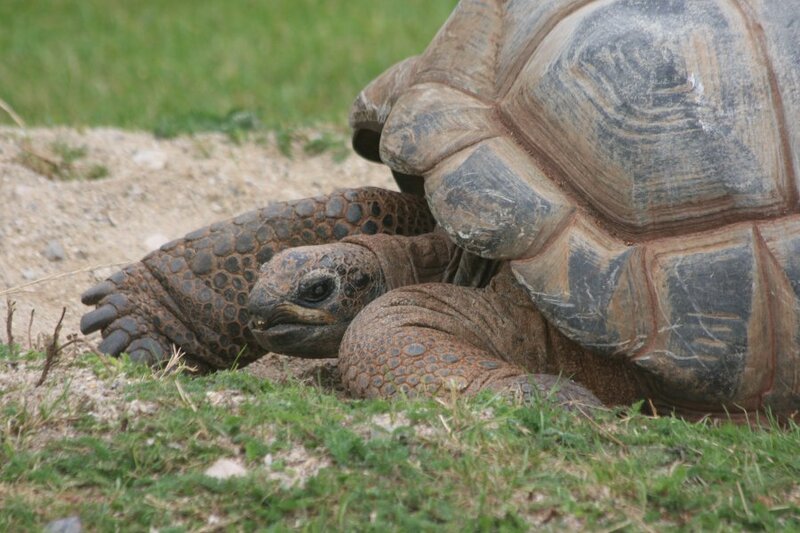 98.66% of Aldabra tortoises have a nuchal scute (the small central scute between the marginal scutes on the shell above the neck). The other obvious differences are in the shape of the head. 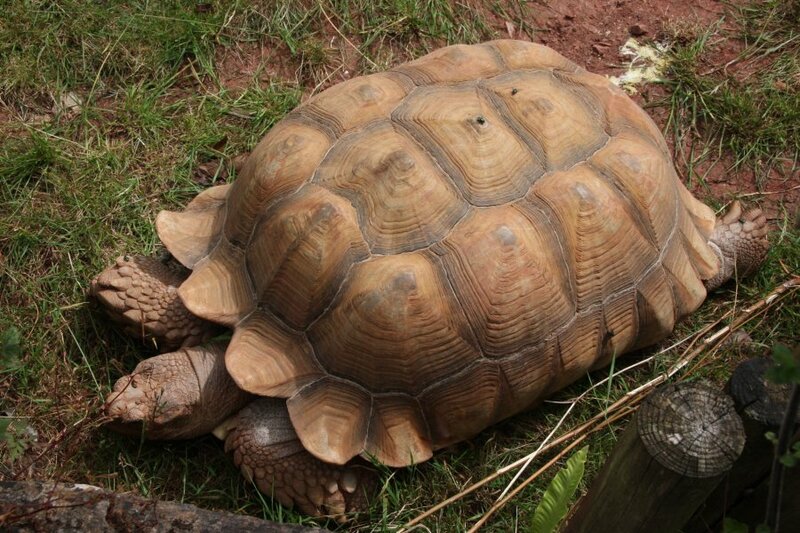 The head of an Aldabra tortoise (like this one) is smaller and narrower, sloping down to the nose, with nostrils lower than the eyes. The head of a Galapagos tortoise is wider and fairly flat on top, with nostrils level with the eyes. 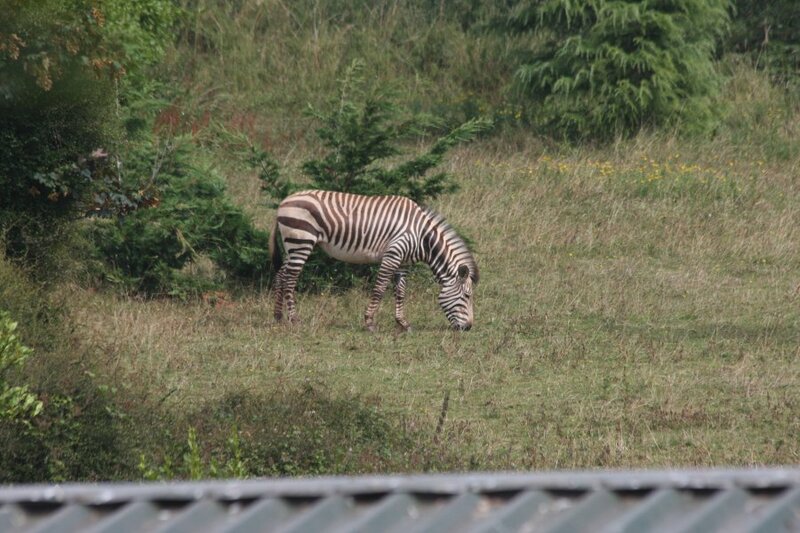 Aldabras live in herds in nature, with each animal weighing up to quarter of a tonne. 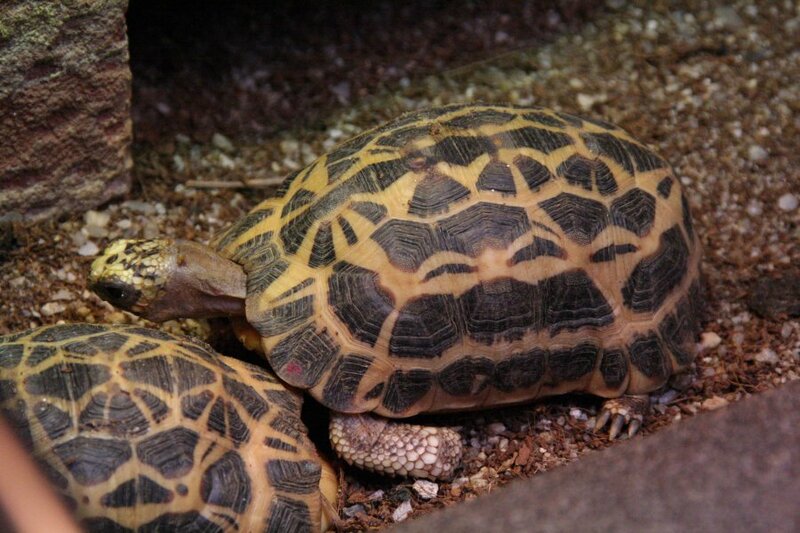 Radiated tortoise, a fairly large tortoise from Madagascar, showing the usual patterns. There are no horizontal rays on the side scutes, and no longitudinal rays on the dorsal scutes (Indian stars have both). 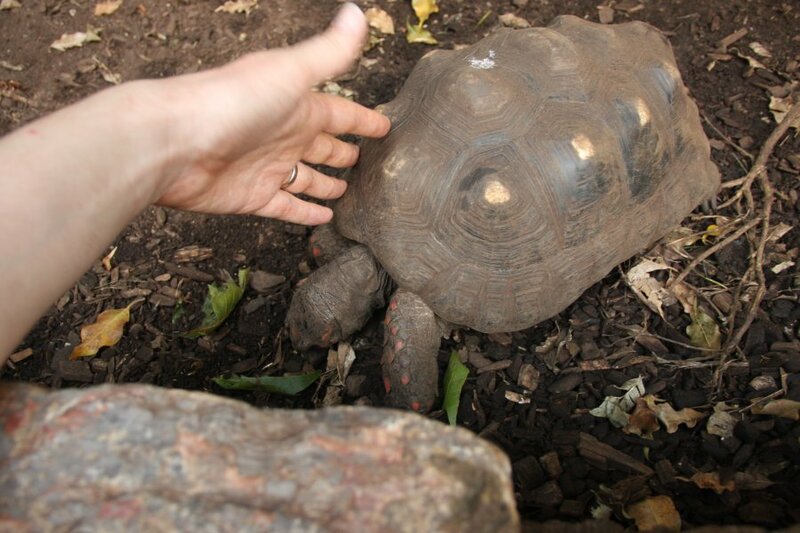 Spider tortoise, a tiny species from Madagascar, which also has beautiful ray patterns. 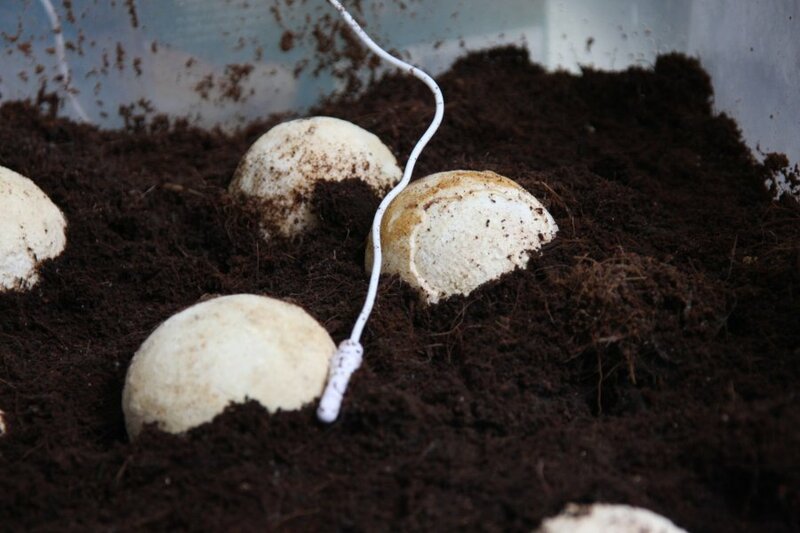 If they weren't critically endangered and nearly impossible to find legally in the pet trade (they are CITES I listed), they would make excellent pet tortoises. 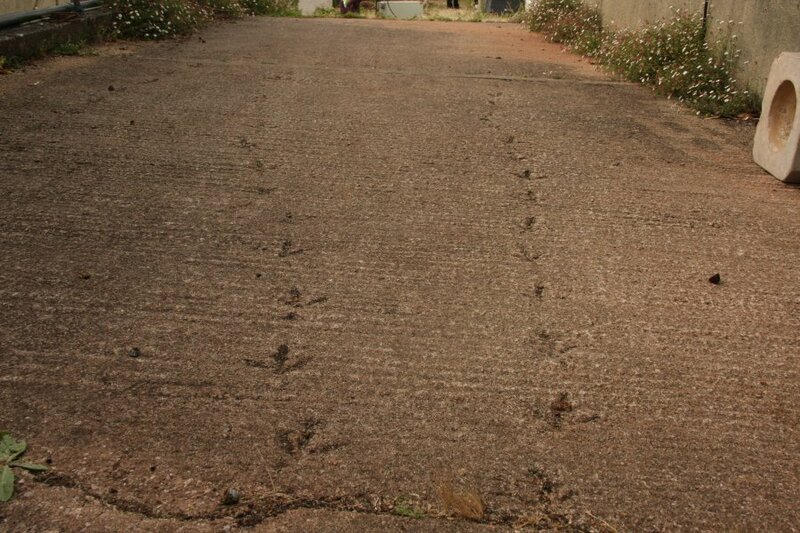 They cannot survive in British gardens, which would force owners to use proper care rather than garden care. 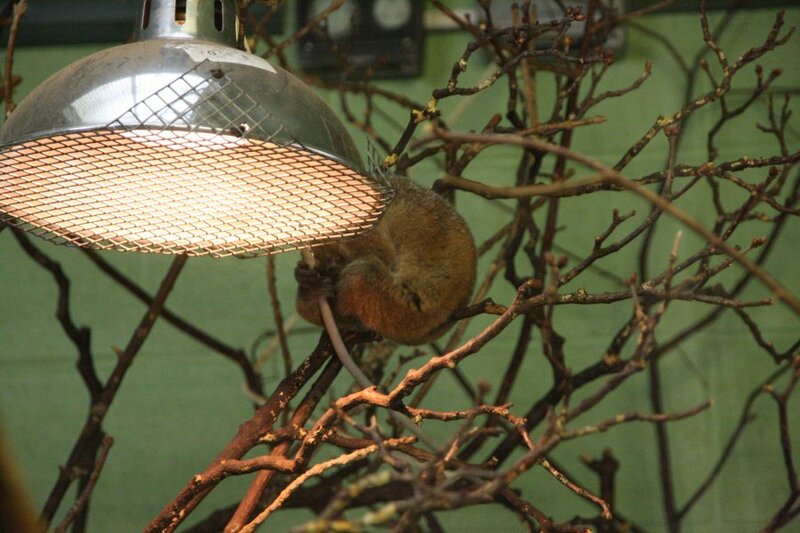 They cannot hibernate, so owners would not try forcing them to endure a British winter. The Indian star is currently a good alternative. 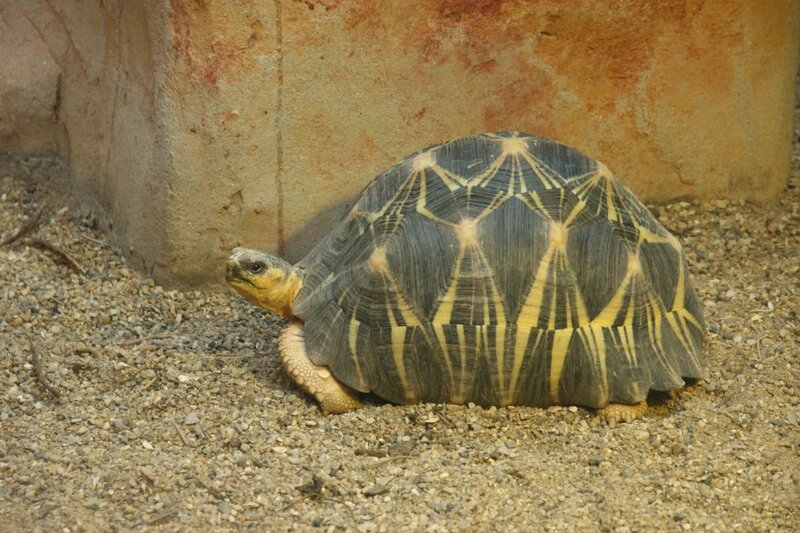 The patterns usually have only horizontal rays on the side scutes, with limited diagonal rays and no vertical rays (Indian stars have all of them, and radiated tortoises only have vertical and diagonal). 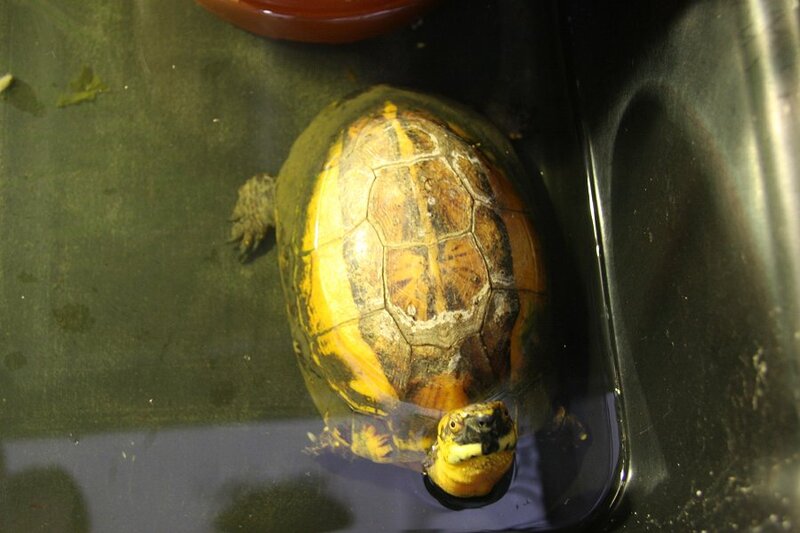 The dorsal scutes have rays poiting sideways (like both Indian stars and radiateds), no longitudinal rays (like radiateds, unlike Indian stars), and often have a complete, dark gap all the way along the dorsal scutes (unlike either Indian stars or radiateds). The side scutes have light gaps above and below them, and sometimes also between them (Indian stars and radiates do not have these gaps). 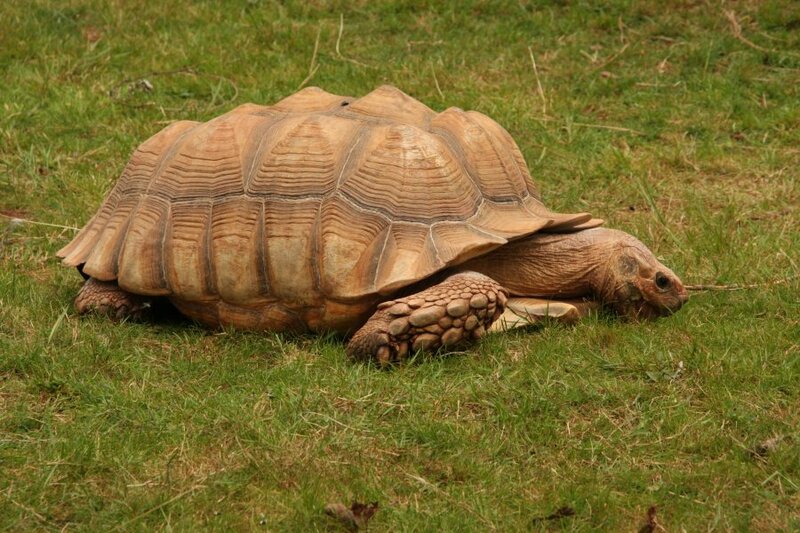 Sulcata tortoise, from mainland Africa. 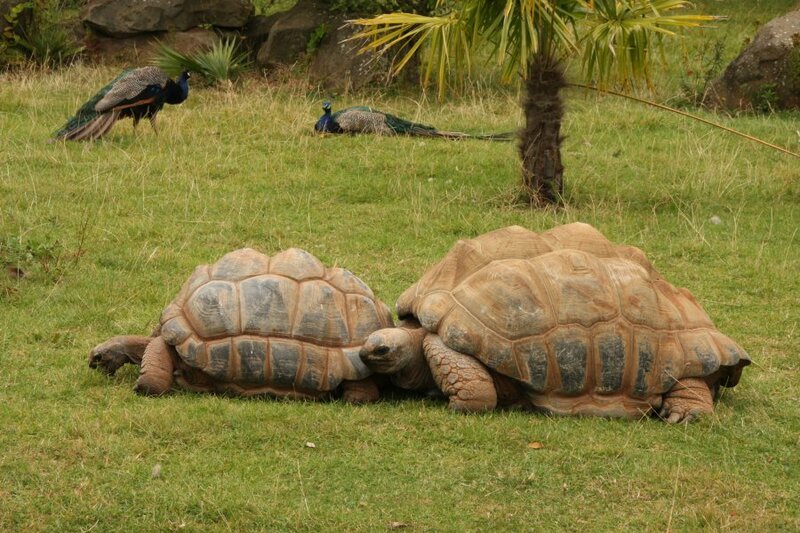 The largest mainland tortoise, and the third largest tortoise, at over 100 kg, able to fend off lions in their natural habitat. These are a very demanding and active species, with a massive appetite, and complex needs. But they make excellent pets, with high intelligence and forming emotional attachments. 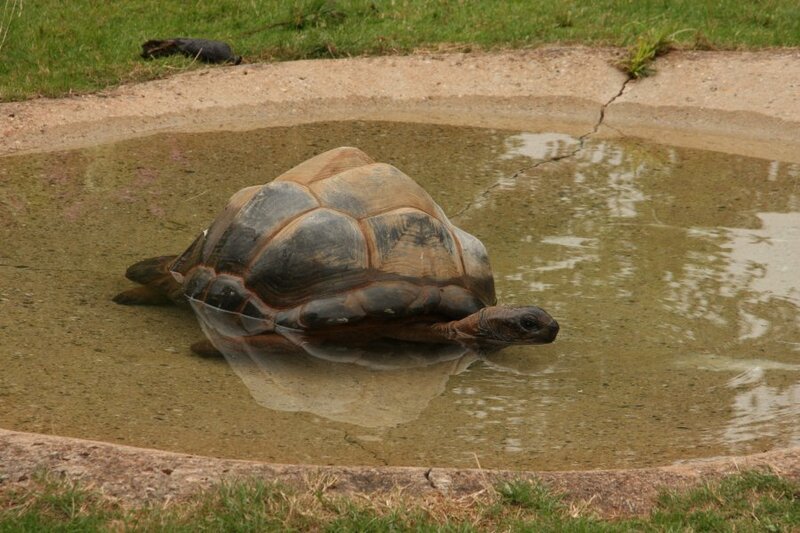 As with all tortoises, they cannot endure Britain except on good days, and they need a large indoor enclosure. 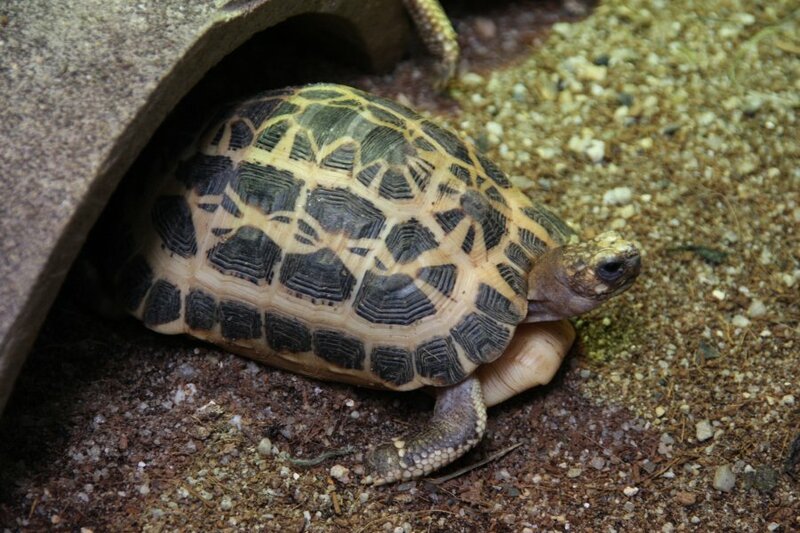 Pancake tortoise, a very small African species. They live in groups, wedged into cracks in the rocks. Home's hinge-backed tortoise. Although it may appear to have a badly damaged shell, I have never seen one with a smooth shell. Perhaps this is just how they are. 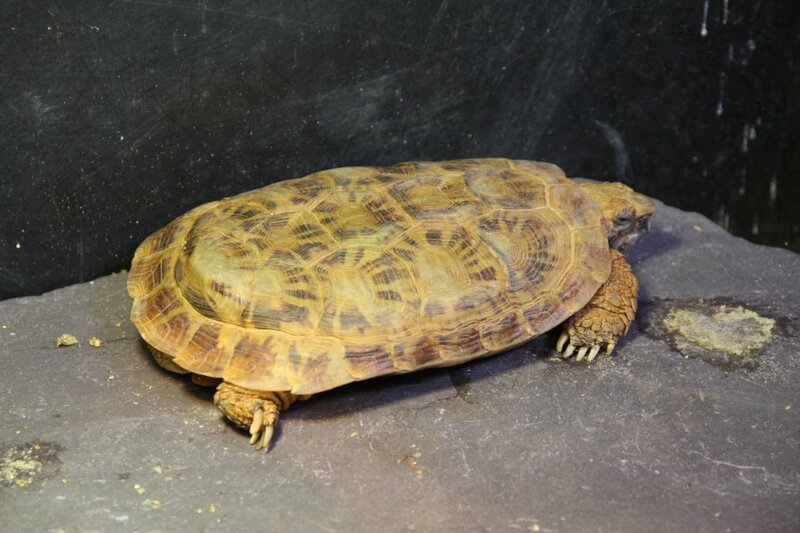 The shell has a soft hinge in the middle (the wrinkly line), and the tortoise can use that to bend the shell, covering the openings when it is hiding inside - like the box turtles, but on its back instead of its front. 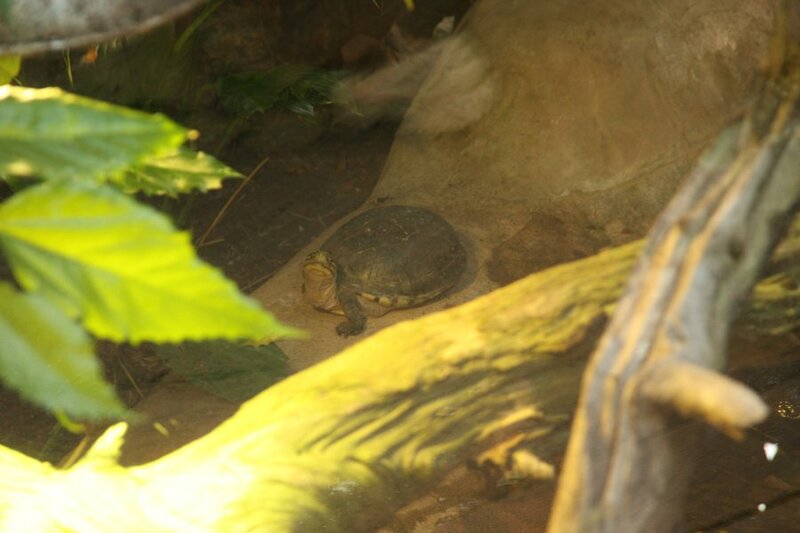 Yellow-footed tortoise, the largest of the South American tortoises, and potentially one of the largest in the World, though this particular one is quite small. 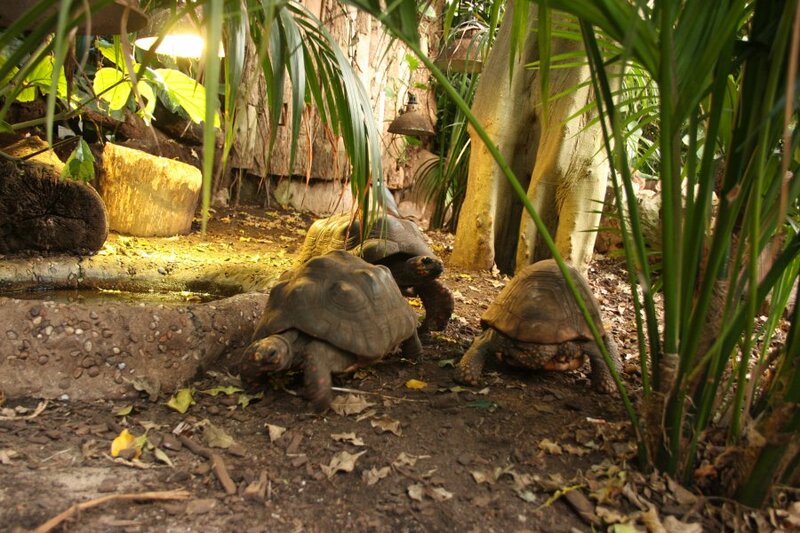 These are a true rainforest tortoise, living in the Amazon. Ideally, this is also how they should be kept in captivity, even giving places for them to swim or wade, since they can do so, and like to sleep in water wallows. Coming over to say hello. 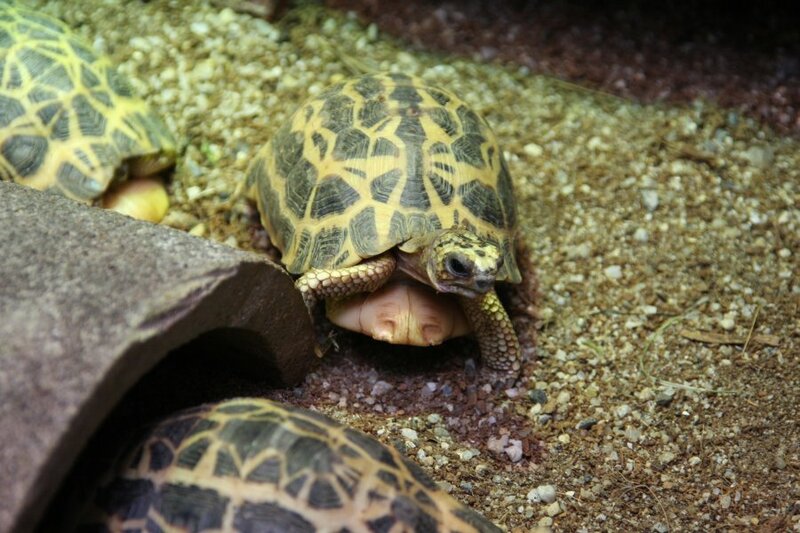 Red-footed tortoises, my personal favourite, and the smaller of the two Amazon species. 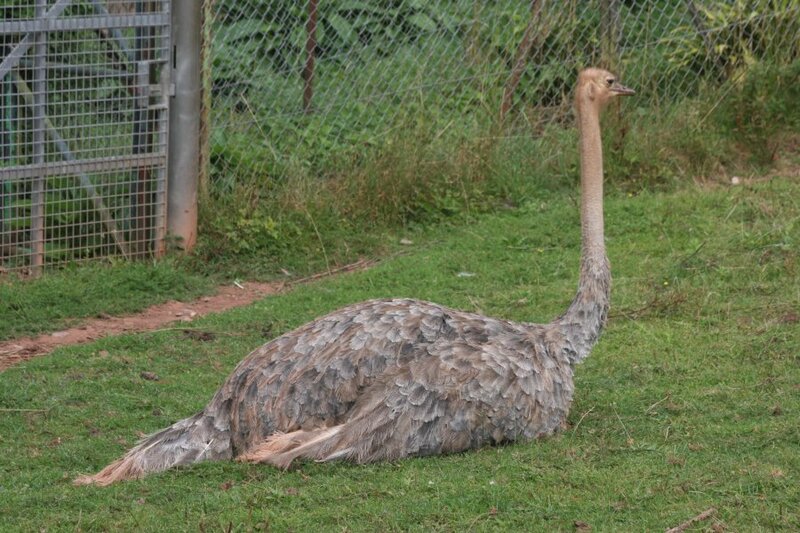 These live on the outer edge of the rainforest, and can cope with a wider range of habitats. 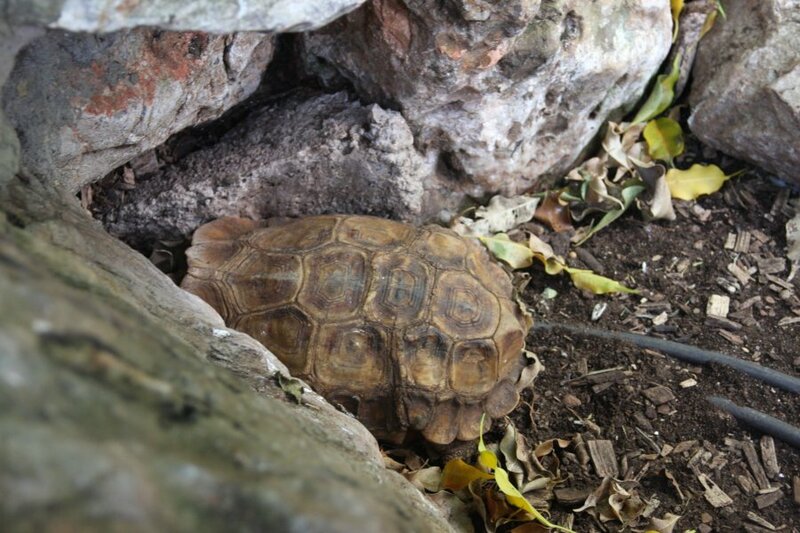 Both are social and like company, spending nights with other tortoises so that they do not have to be alone. Ideally, they should be perfectly smooth, not lumpy (I do not know the history of these animals, or whether they were lumpy before they got here). 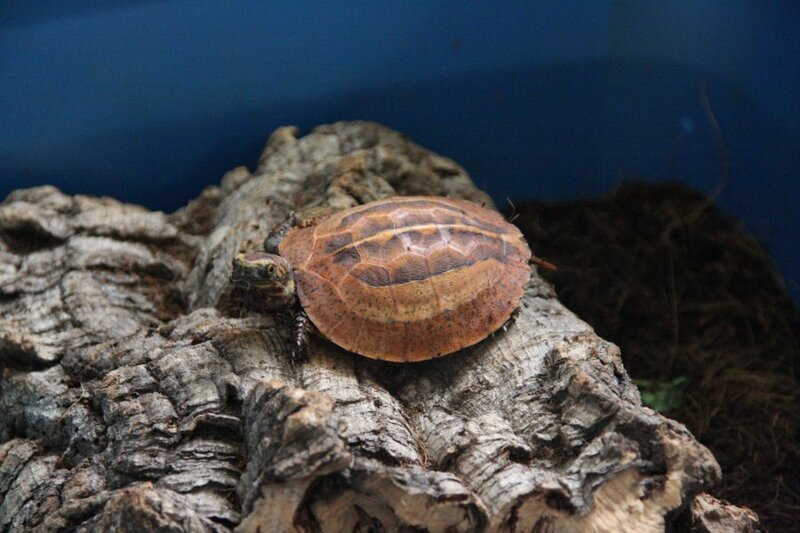 Malay box turtle, from southeast Asia. 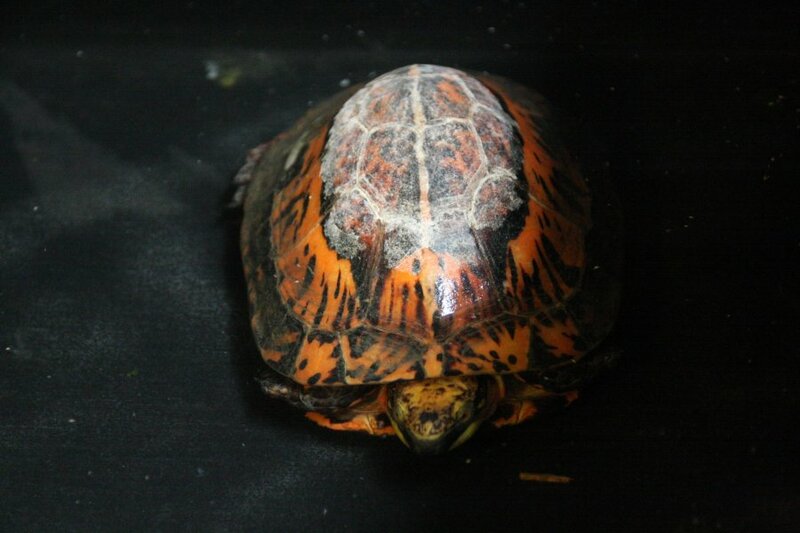 Box turtles can pull themselves into the shell, then use hinges on the plastron (lower shell) to close the openings, leaving them completely hidden. 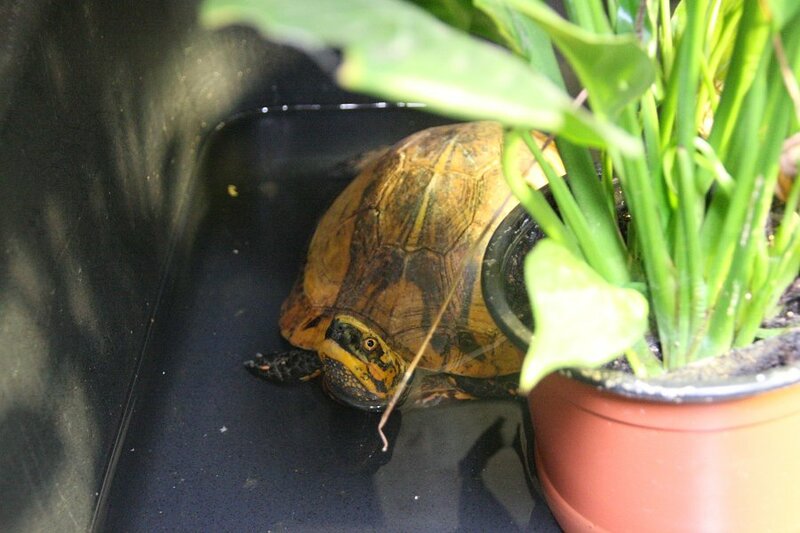 The zoo is undertaking in a breeding programme for the critically endangered Indochinese box turtle. 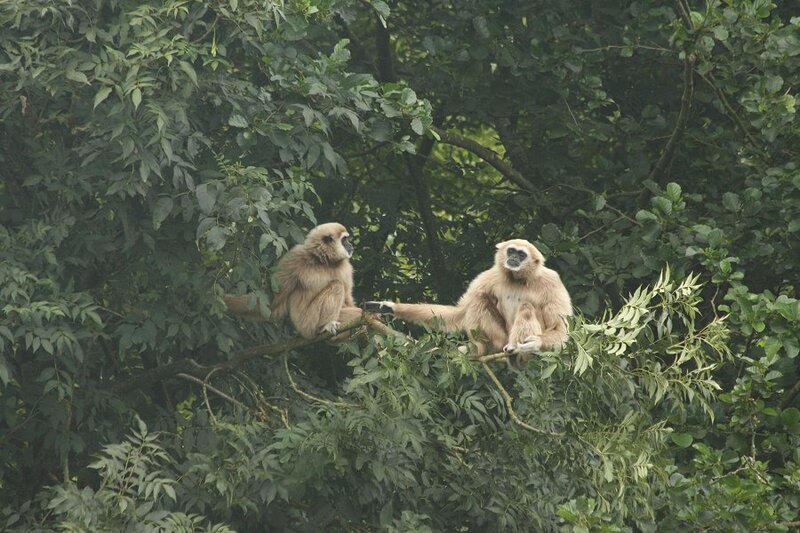 These appear to be the northern Vietnamese subspecies. 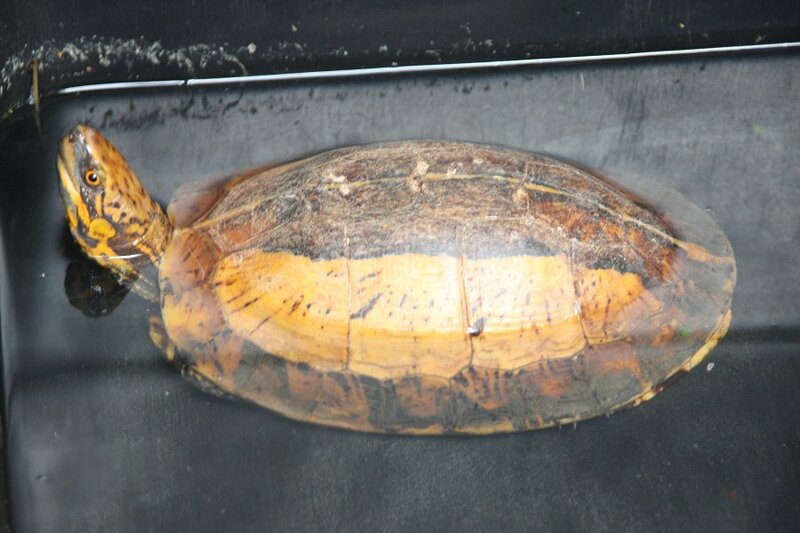 The dark marking on the back, combined with the lighter yellow sides are characteristic of the northern Vietnamese Indochinese box turtle, though the defining difference between subspecies is whether the plastron is completely black or not. This one is really quite red indeed, but is still the same subspecies; the central subspecies has a much more blotched red-on-black pattern without the brighter sides. The second of three hatchling Indochinese box turtles. 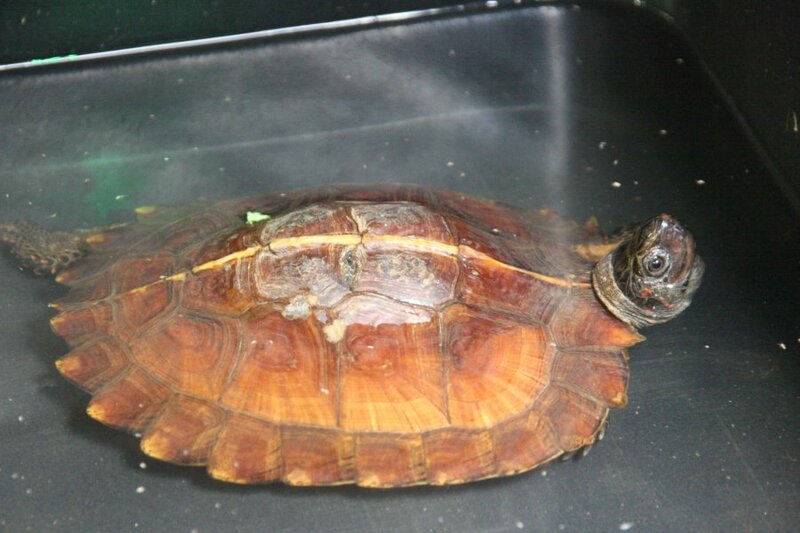 Spiny turtle, another endangered species from southeast Asia. 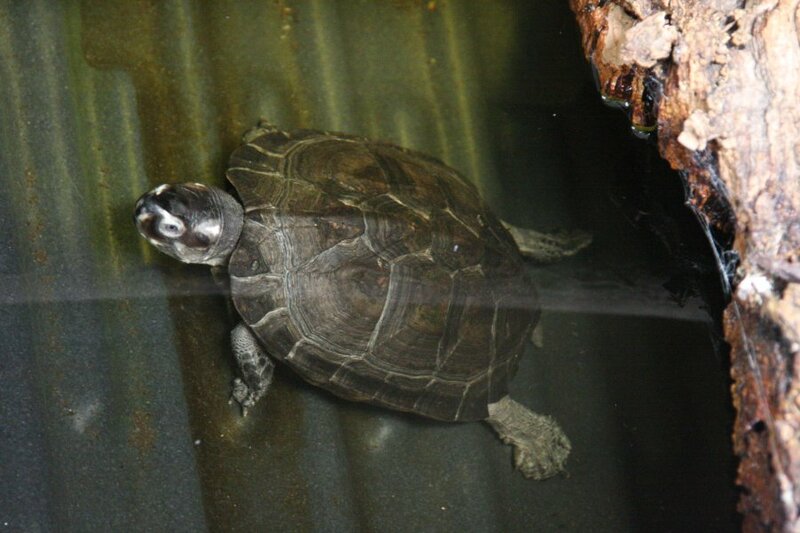 Black marsh turtle, another southeast Asian species. 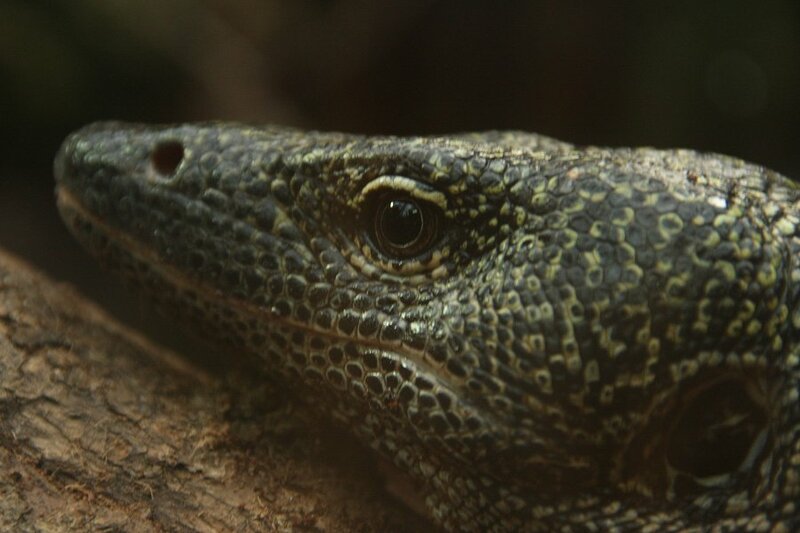 Mangrove monitor lizard, from Australia and southeast Asia. Relatively small. Looking forward to the overhaul. Henkel's leaf-tailed gecko, a Madagascan species. 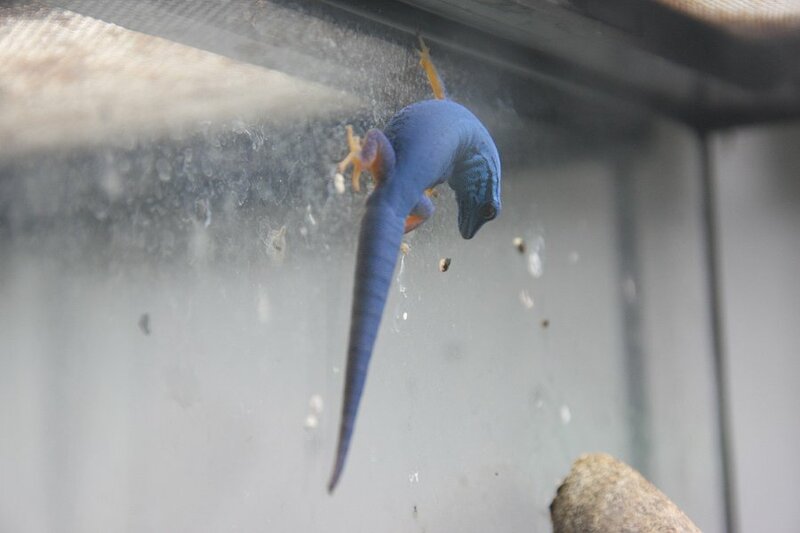 Electric blue gecko, a critically endagered African day gecko species. As of this year, it is CITES I listed, and hopefully this will reduce its illegal collection for the pet trade; its biggest threat. Captive breeding is the way forward. 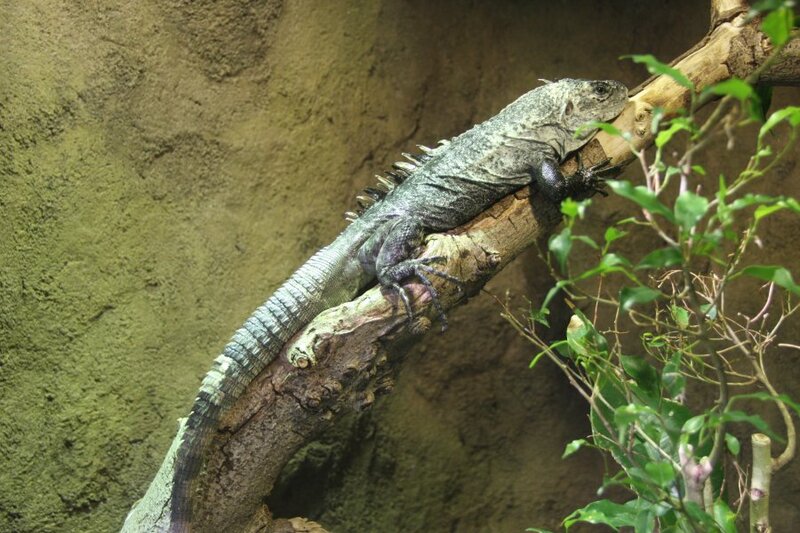 Utila spiny-tailed iguana, a critically endangered Central American iguana. 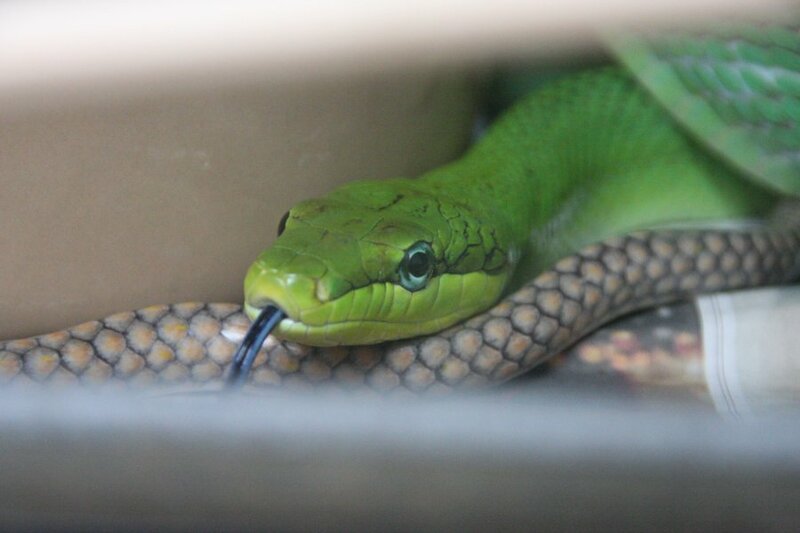 Red-tailed racer, the beautiful arboreal colubrid snake from southeast Asia that is very popular in zoos. 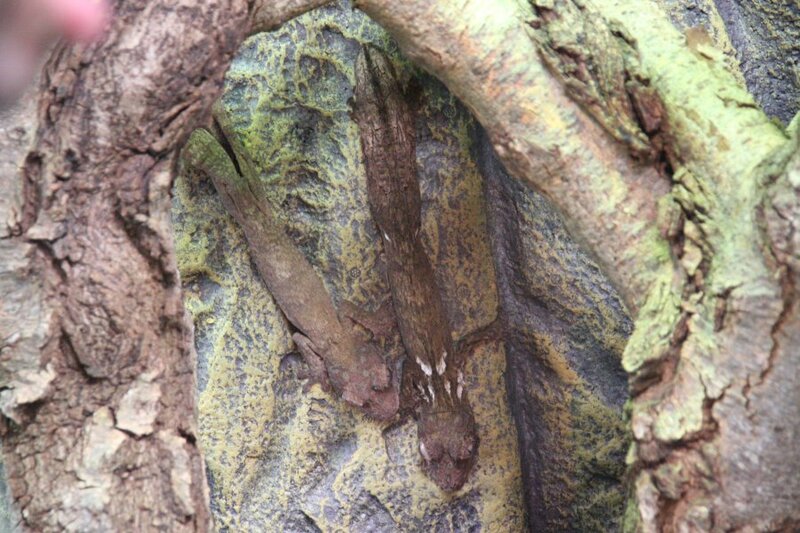 A pair of Malagasy tree boas, a Madagascan species, one of the few large boas from the African continent. 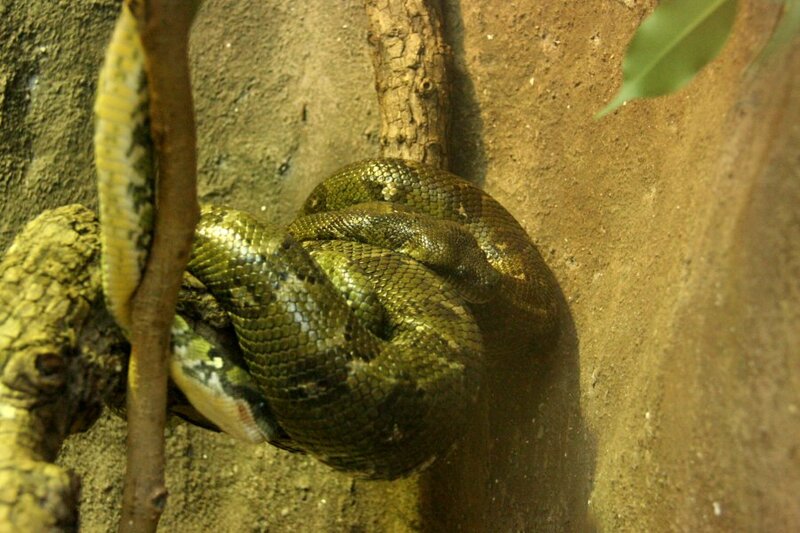 Malagasy tree boa. These appear to be the nominate subspecies - green rather than brown. 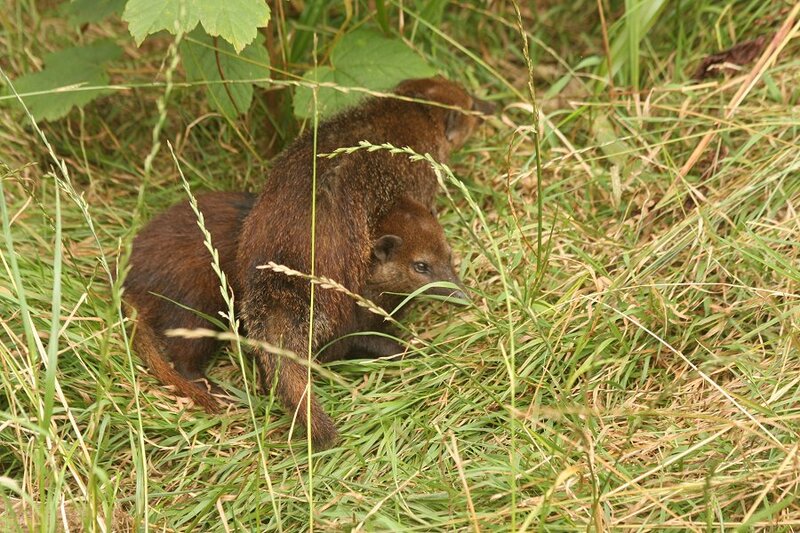 As neonates, they are red. 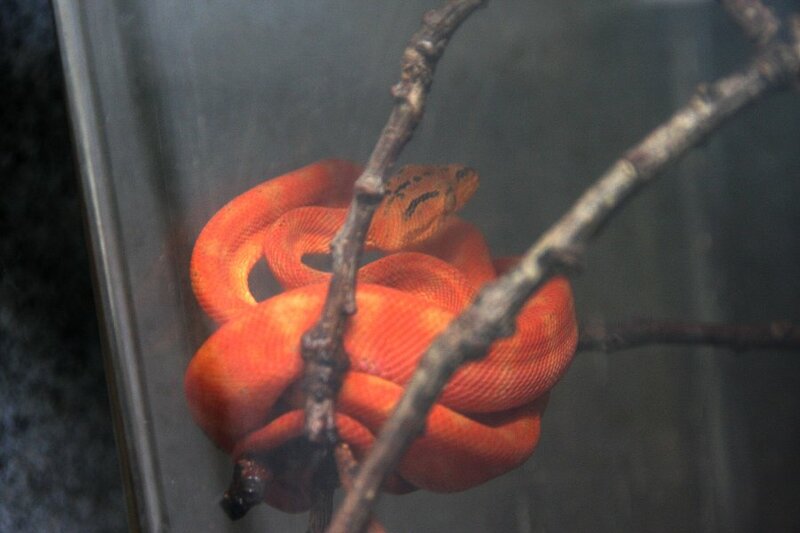 Jamaican boa, from the Caribbean island - the more normal continent for boas. 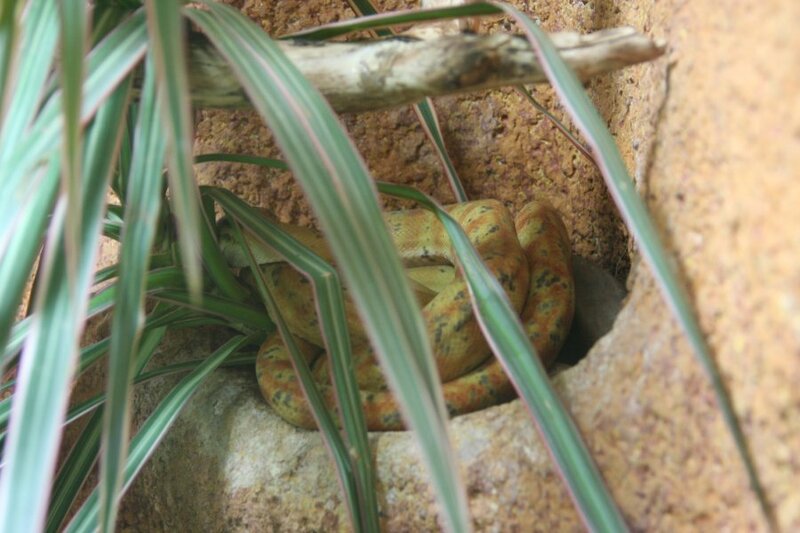 Cooke's tree boa, which looks very similar to some of the Amazon tree boa colour phases. Hot air balloons over Severn Beach. 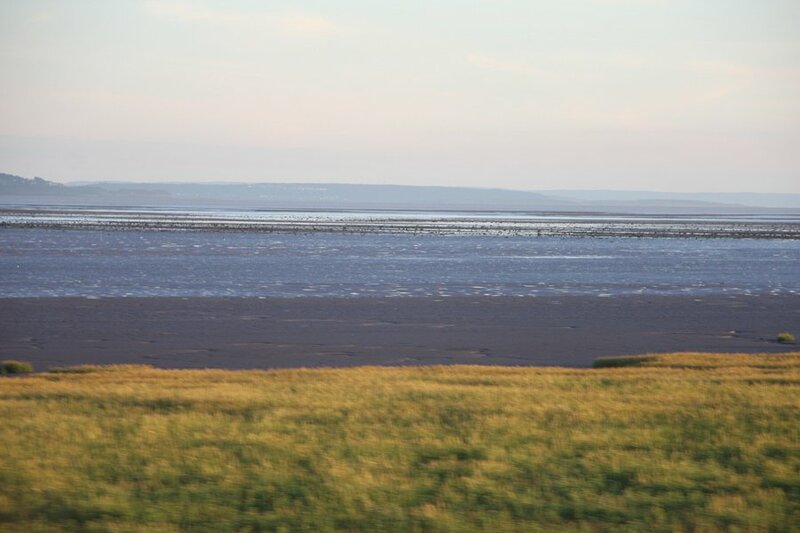 Bedwin Sands at the Severn Estuary near Caldicot. 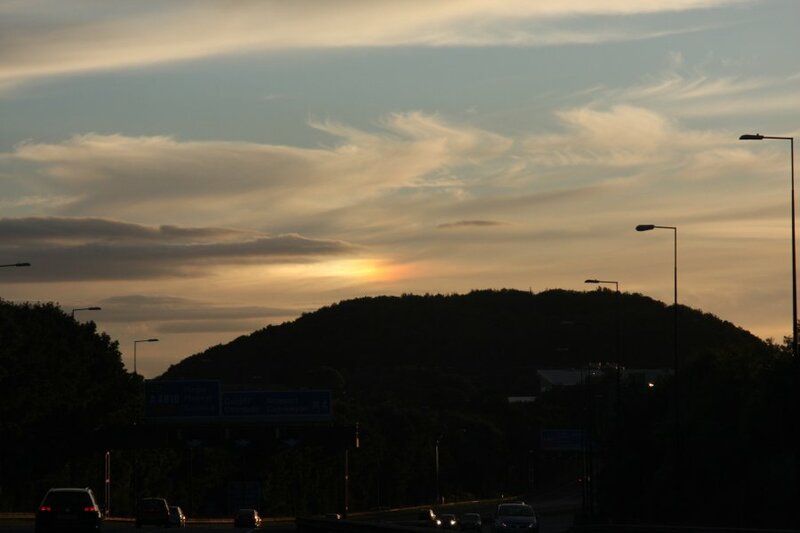 Right sun dog (the bright spot) intersecting a 22° halo (circular rainbow), both of which are made by the sun shining through ice clouds. Approaching Magor. 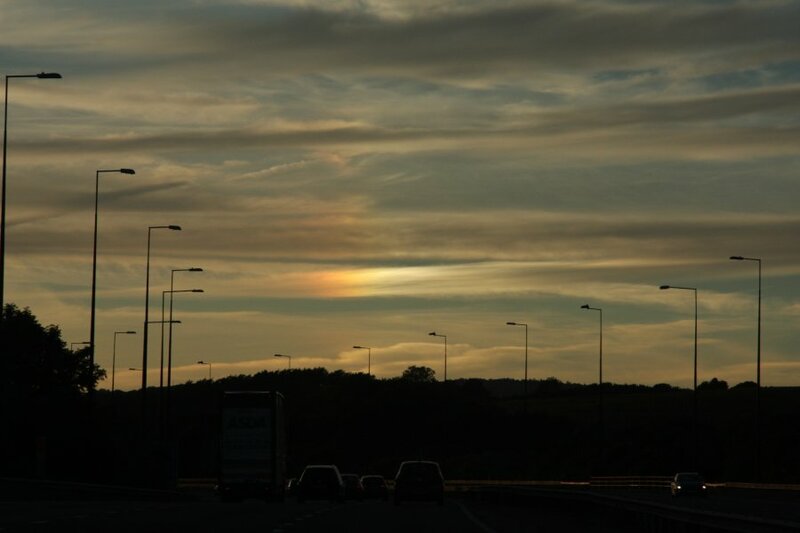 Left sun dog. 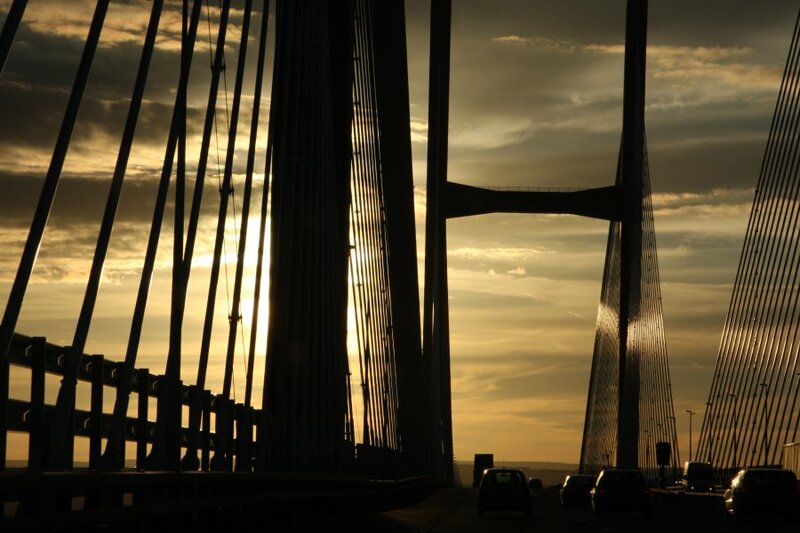 Approaching Newport.